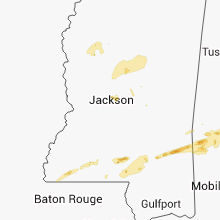 The Arnold Line, MS area has had 0 reports of on-the-ground hail by trained spotters, and has been under severe weather warnings 22 times during the past 12 months. 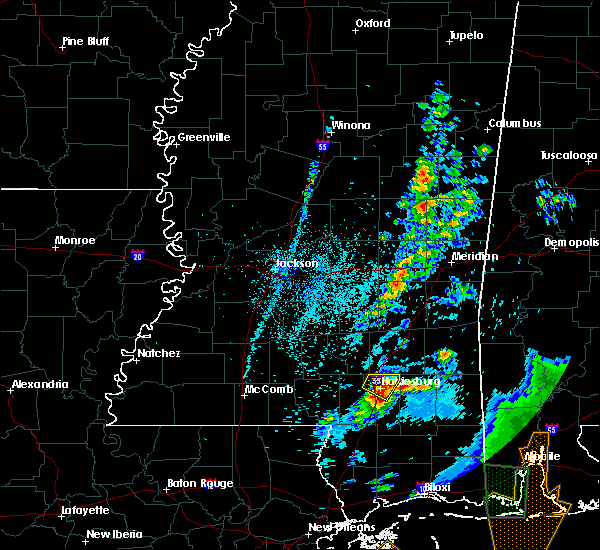 Doppler radar has detected hail at or near Arnold Line, MS on 22 occasions, including 1 occasion during the past year. 4/18/2019 7:56 PM CDT At 755 pm cdt, severe thunderstorms were located along a line extending from near sanford to near baxterville, moving east at 30 mph (radar indicated). Hazards include 60 mph wind gusts. Expect damage to roofs, siding, and trees. 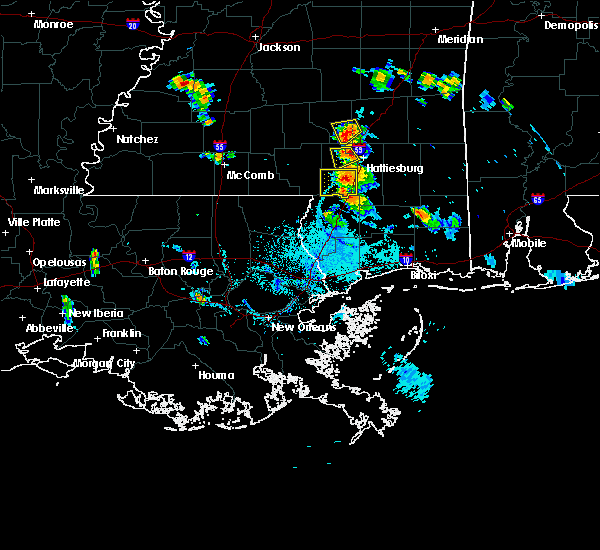 these severe storms will be near, sumrall around 800 pm cdt. Purvis and pine ridge around 815 pm cdt. 4/18/2019 7:29 PM CDT At 728 pm cdt, severe thunderstorms were located along a line extending from near bunker hill to near dexter, moving northeast at 55 mph (radar indicated). Hazards include 60 mph wind gusts. Expect damage to roofs, siding, and trees. 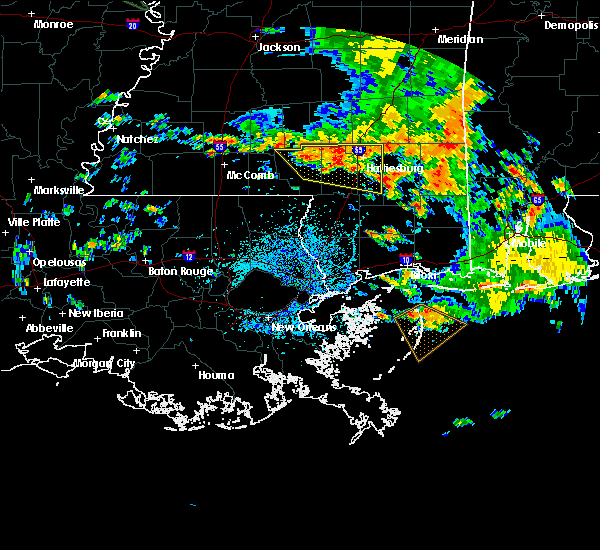 severe thunderstorms will be near, sumrall around 740 pm cdt. pinebur around 745 pm cdt. baxterville around 750 pm cdt. 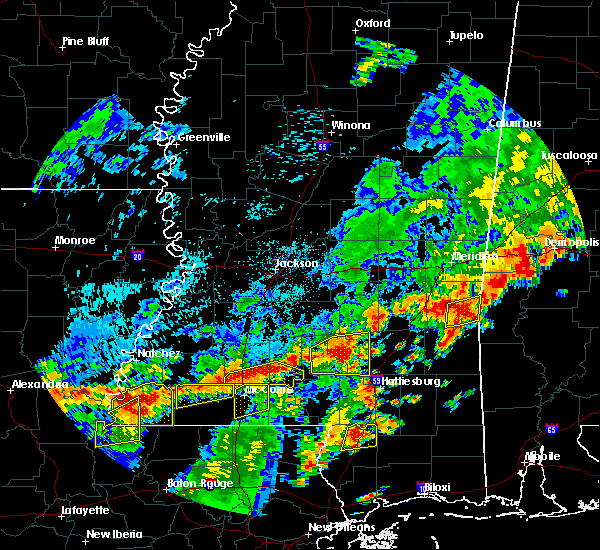 hattiesburg, purvis, oak grove and pine ridge around 805 pm cdt. West hattiesburg around 810 pm cdt. 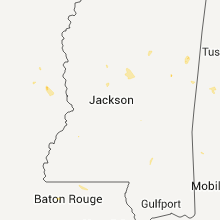 4/18/2019 4:45 PM CDT At 444 pm cdt, a severe thunderstorm capable of producing a tornado was located near hattiesburg, moving east at 35 mph (radar indicated rotation). Hazards include tornado. Flying debris will be dangerous to those caught without shelter. mobile homes will be damaged or destroyed. damage to roofs, windows, and vehicles will occur. tree damage is likely. this dangerous storm will be near, petal around 455 pm cdt. sunrise around 500 pm cdt. Macedonia around 505 pm cdt. 4/18/2019 4:35 PM CDT At 435 pm cdt, a severe thunderstorm capable of producing a tornado was located over west hattiesburg, moving northeast at 45 mph (radar indicated rotation). Hazards include tornado. Flying debris will be dangerous to those caught without shelter. mobile homes will be damaged or destroyed. damage to roofs, windows, and vehicles will occur. tree damage is likely. this dangerous storm will be near, hattiesburg and oak grove around 440 pm cdt. 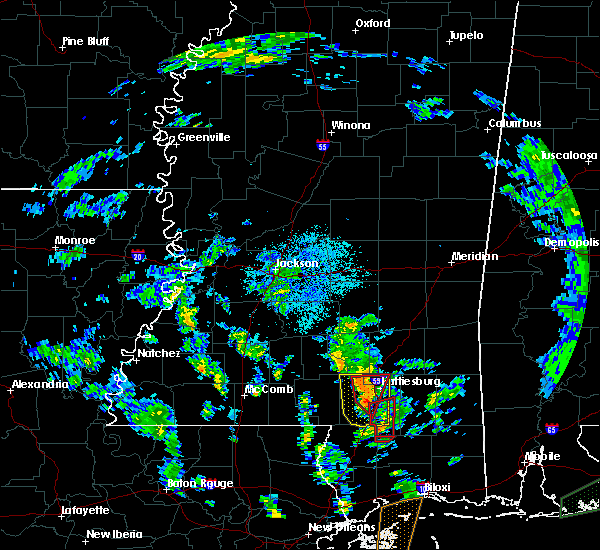 petal around 445 pm cdt. sunrise and eastabuchie around 450 pm cdt. macedonia around 455 pm cdt. Ovett around 510 pm cdt. 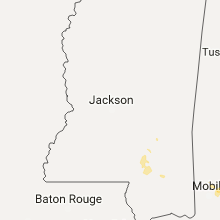 4/18/2019 4:27 PM CDT At 427 pm cdt, a severe thunderstorm capable of producing a tornado was located 7 miles southwest of west hattiesburg, moving northeast at 45 mph (radar indicated rotation). Hazards include tornado. Flying debris will be dangerous to those caught without shelter. mobile homes will be damaged or destroyed. damage to roofs, windows, and vehicles will occur. tree damage is likely. this dangerous storm will be near, hattiesburg around 430 pm cdt. oak grove around 435 pm cdt. 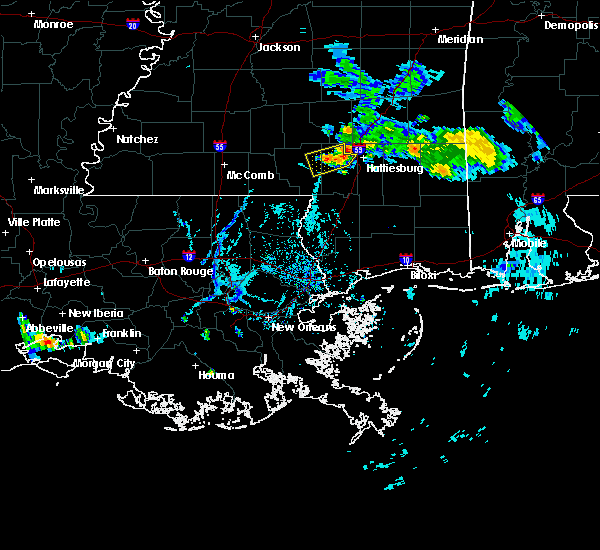 west hattiesburg and rawls springs around 440 pm cdt. 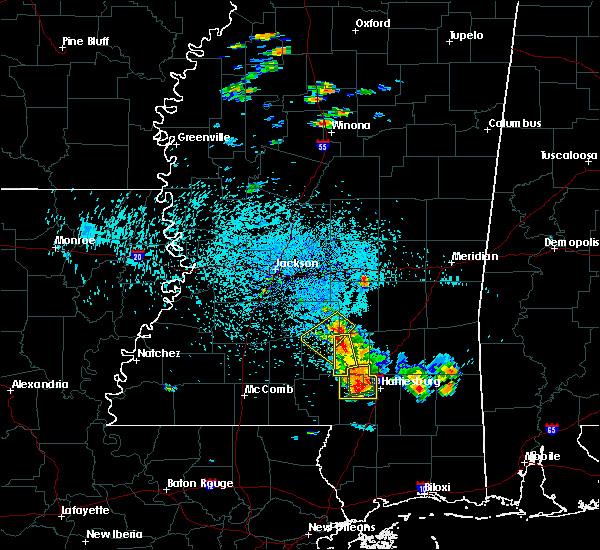 petal around 445 pm cdt. sunrise and eastabuchie around 450 pm cdt. macedonia around 455 pm cdt. Ovett around 510 pm cdt. 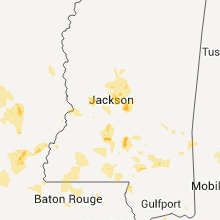 4/18/2019 4:15 PM CDT At 414 pm cdt, severe thunderstorms were located along a line extending from near sumrall to sandy hook, moving east at 30 mph (radar indicated). Hazards include 60 mph wind gusts. Expect damage to roofs, siding, and trees. severe thunderstorms will be near, rawls springs around 430 pm cdt. baxterville around 445 pm cdt. lumberton around 455 pm cdt. purvis around 505 pm cdt. rock hill around 515 pm cdt. mclaurin around 530 pm cdt. 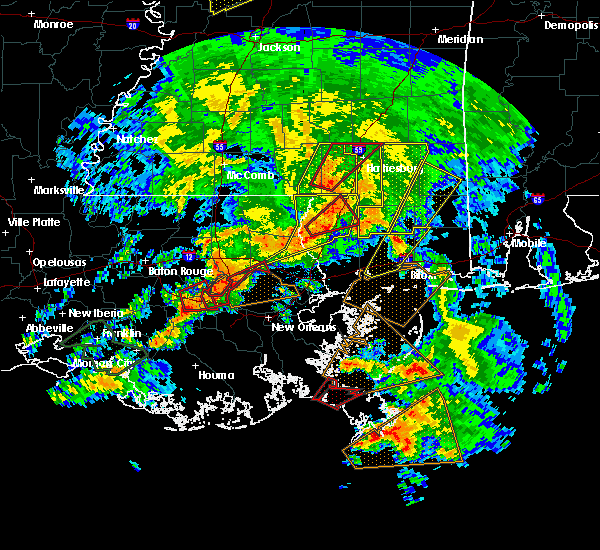 A tornado watch remains in effect until 900 pm cdt for southeastern mississippi. 3/3/2019 11:47 AM CST At 1146 am cst, severe thunderstorms were located along a line extending from ovett to west hattiesburg, moving east at 35 mph (radar indicated). Hazards include 60 mph wind gusts. Expect damage to roofs, siding, and trees. these severe storms will be near, ovett and oak grove around 1150 am cst. macedonia around 1200 pm cst. other locations impacted by these severe thunderstorms include corinth. 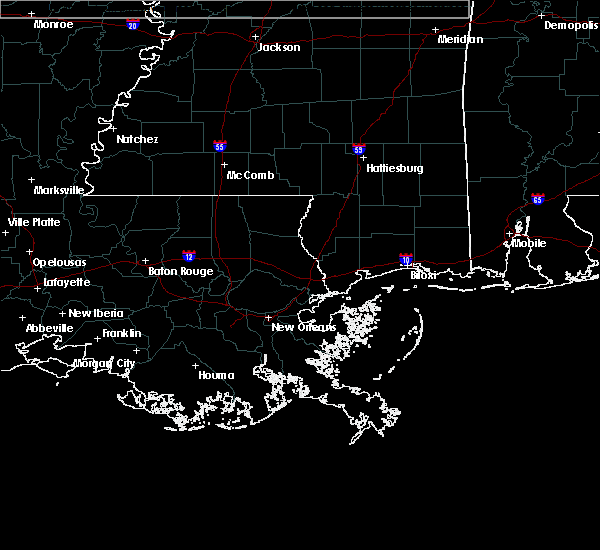 A tornado watch remains in effect until 600 pm cst for southeastern mississippi. 3/3/2019 11:34 AM CST At 1134 am cst, severe thunderstorms were located along a line extending from near ovett to 6 miles west of west hattiesburg, moving east at 45 mph (radar indicated). Hazards include 60 mph wind gusts. Expect damage to roofs, siding, and trees. these severe storms will be near, oak grove and ovett around 1140 am cst. petal around 1150 am cst. sunrise around 1155 am cst. macedonia around 1200 pm cst. other locations impacted by these severe thunderstorms include corinth. 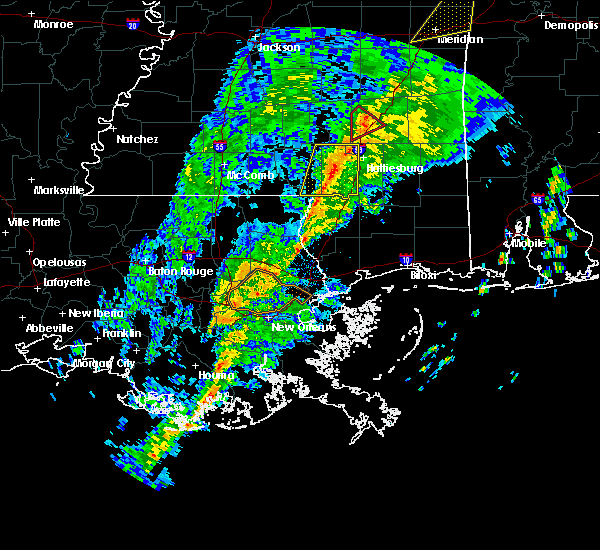 A tornado watch remains in effect until 600 pm cst for southeastern mississippi. 3/3/2019 11:27 AM CST At 1127 am cst, severe thunderstorms were located along a line extending from near moselle to 7 miles south of sumrall, moving east at 45 mph (radar indicated). Hazards include 60 mph wind gusts. Expect damage to roofs, siding, and trees. these severe storms will be near, moselle around 1130 am cst. hattiesburg around 1135 am cst. oak grove and tuckers crossing around 1140 am cst. west hattiesburg, ovett and rawls springs around 1145 am cst. petal and sunrise around 1155 am cst. macedonia around 1200 pm cst. other locations impacted by these severe thunderstorms include corinth. 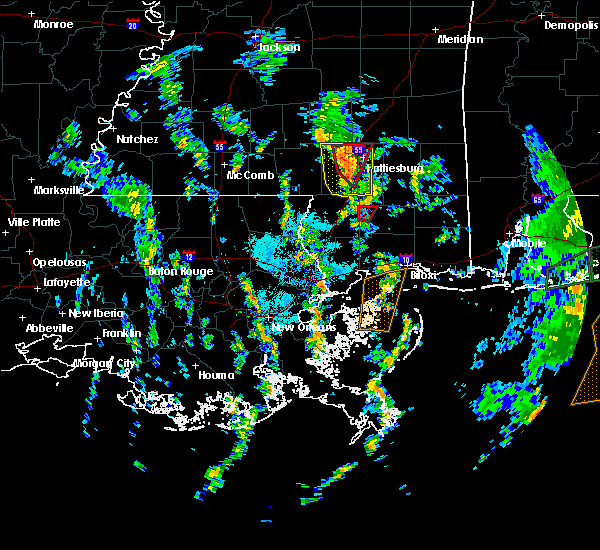 A tornado watch remains in effect until 600 pm cst for southeastern mississippi. 3/3/2019 11:14 AM CST At 1113 am cst, severe thunderstorms were located along a line extending from near sanford to near improve, moving east at 45 mph (radar indicated). Hazards include 60 mph wind gusts. Expect damage to roofs, siding, and trees. these severe storms will be near, moselle and eastabuchie around 1120 am cst. 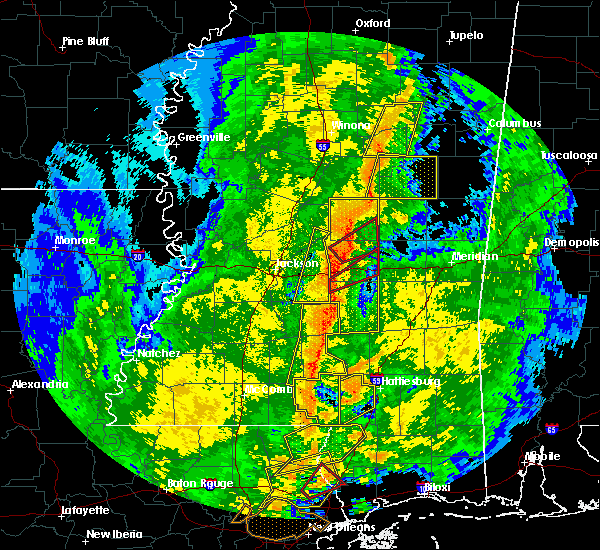 laurel, ellisville and sumrall around 1125 am cst. hattiesburg, pine ridge and tuckers crossing around 1135 am cst. west hattiesburg, oak grove, ovett and rawls springs around 1140 am cst. 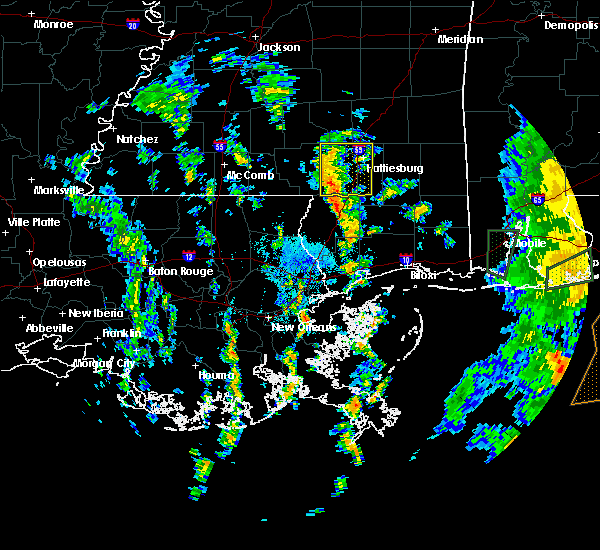 petal around 1150 am cst. sunrise and macedonia around 1155 am cst. other locations impacted by these severe thunderstorms include corinth. 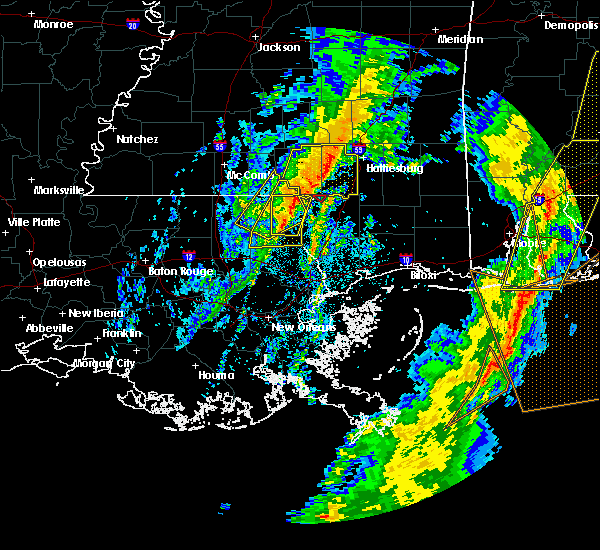 A tornado watch remains in effect until 600 pm cst for south central and southeastern mississippi. 3/3/2019 11:04 AM CST At 1104 am cst, severe thunderstorms were located along a line extending from near sanford to near goss, moving east at 45 mph (radar indicated). Hazards include 60 mph wind gusts. Expect damage to roofs, siding, and trees. severe thunderstorms will be near, sanford around 1110 am cst. moselle and melba around 1120 am cst. 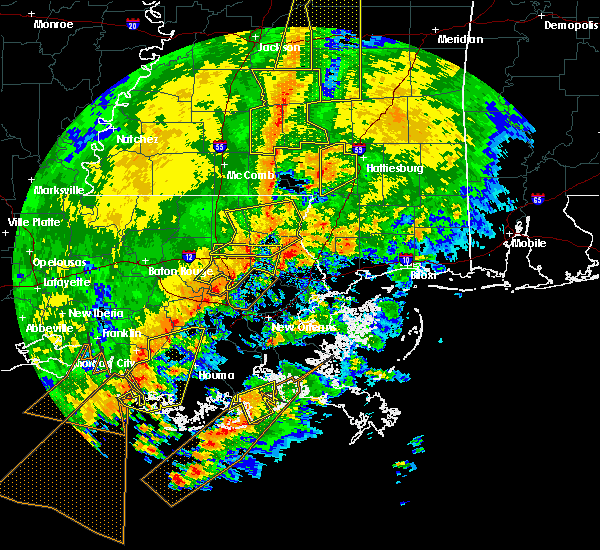 laurel, ellisville and sumrall around 1130 am cst. 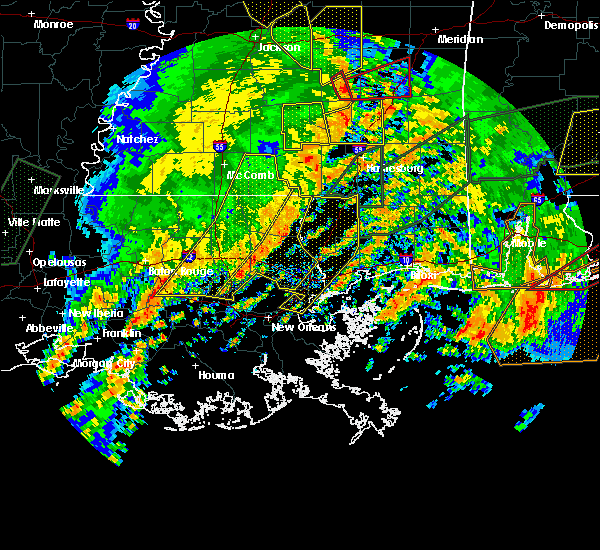 hattiesburg and tuckers crossing around 1135 am cst. ovett and oak grove around 1140 am cst. west hattiesburg and rawls springs around 1145 am cst. eastabuchie around 1150 am cst. petal and sunrise around 1155 am cst. other locations impacted by these severe thunderstorms include seminary and corinth. 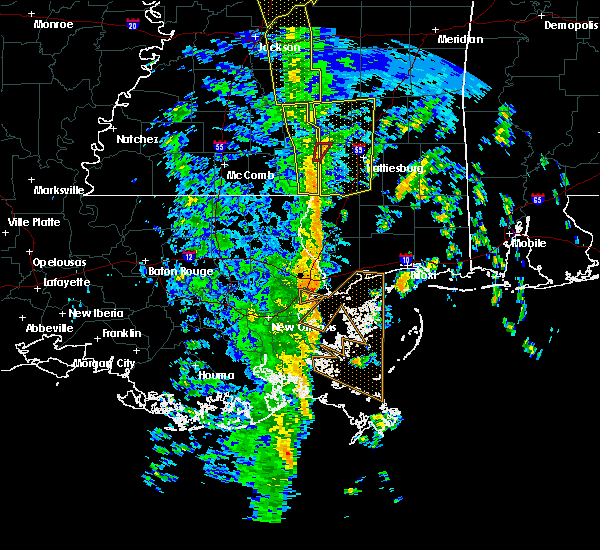 A tornado watch remains in effect until 600 pm cst for south central and southeastern mississippi. 1/19/2019 10:24 AM CST At 1024 am cst, severe thunderstorms were located along a line extending from eastabuchie to 7 miles south of baxterville, moving east at 45 mph (radar indicated). Hazards include 60 mph wind gusts. Expect damage to roofs, siding, and trees. 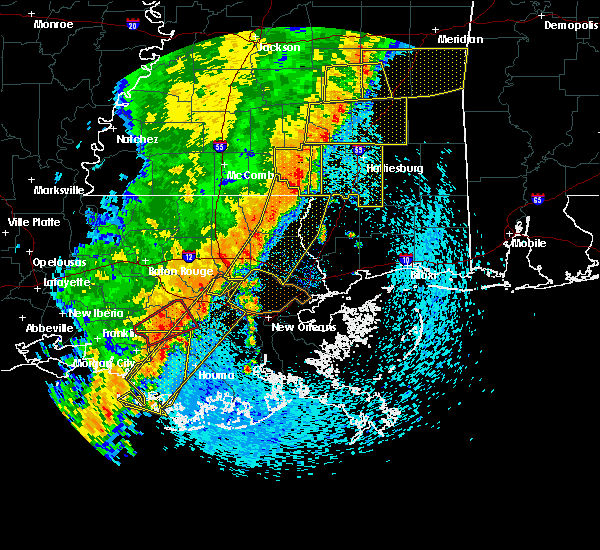 severe thunderstorms will be near, petal around 1030 am cst. macedonia around 1035 am cst. purvis around 1045 am cst. rock hill around 1050 am cst. 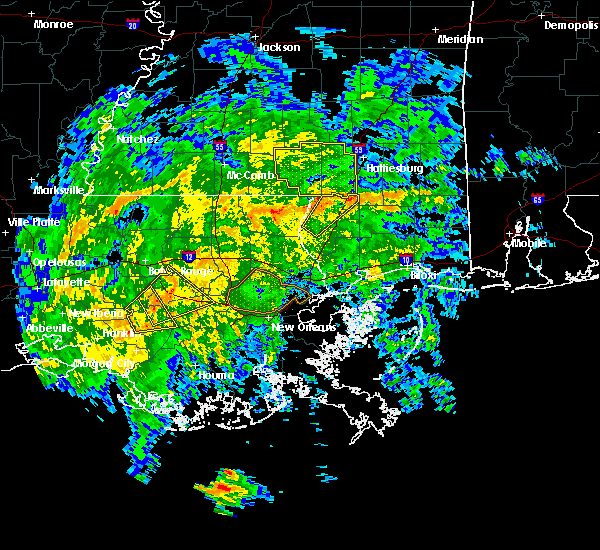 maxie around 1055 am cst. brooklyn and mclaurin around 1100 am cst. 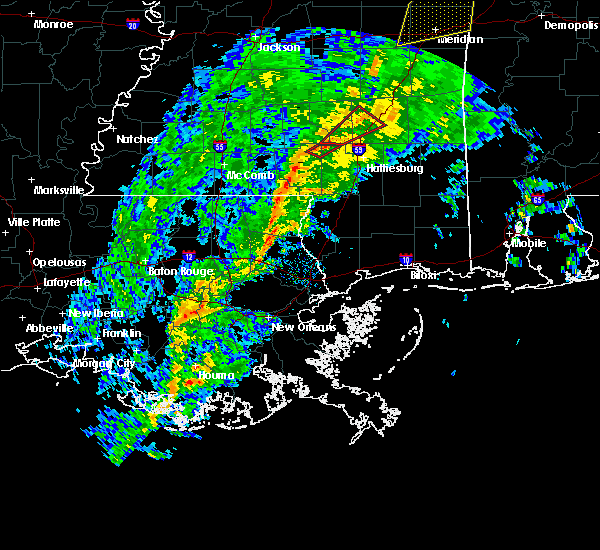 A tornado watch remains in effect until 100 pm cst for southeastern mississippi. 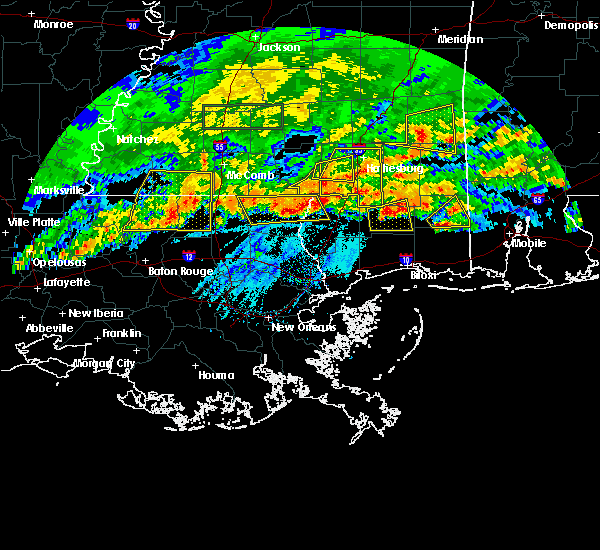 1/19/2019 10:10 AM CST At 1010 am cst, severe thunderstorms were located along a line extending from near sumrall to near baxterville, moving east at 45 mph (radar indicated). Hazards include 60 mph wind gusts. Expect damage to roofs, siding, and trees. 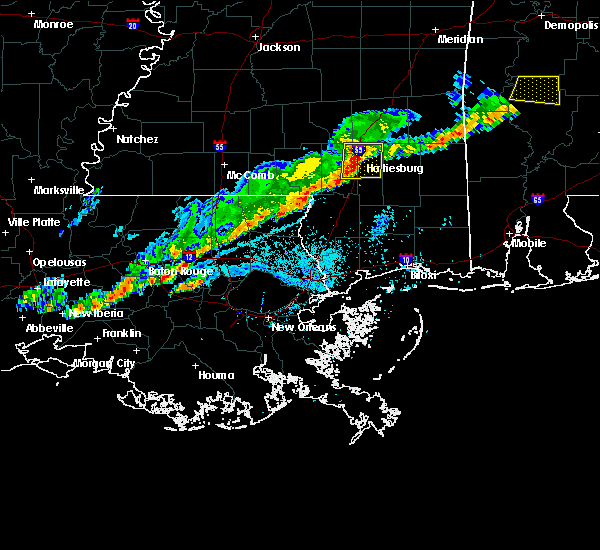 these severe storms will be near, sumrall around 1015 am cst. west hattiesburg and rawls springs around 1020 am cst. lumberton around 1025 am cst. purvis and pine ridge around 1030 am cst. 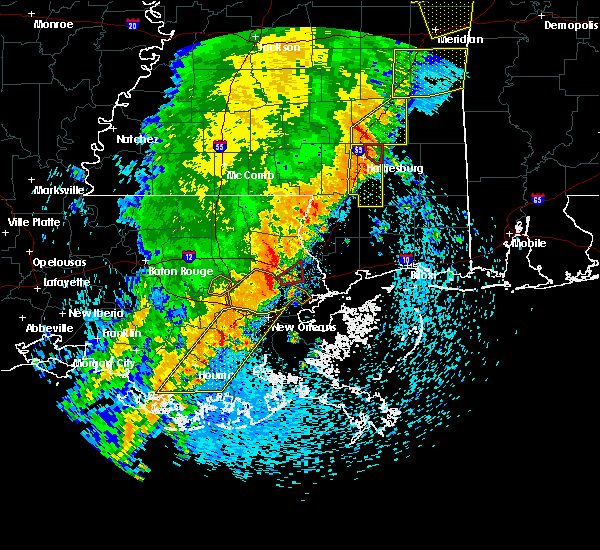 A tornado watch remains in effect until 100 pm cst for south central and southeastern mississippi. 1/19/2019 9:51 AM CST At 951 am cst, severe thunderstorms were located along a line extending from near improve to 6 miles southwest of sandy hook, moving east at 45 mph (radar indicated). Hazards include 60 mph wind gusts. Expect damage to roofs, siding, and trees. severe thunderstorms will be near, improve and bunker hill around 955 am cst. 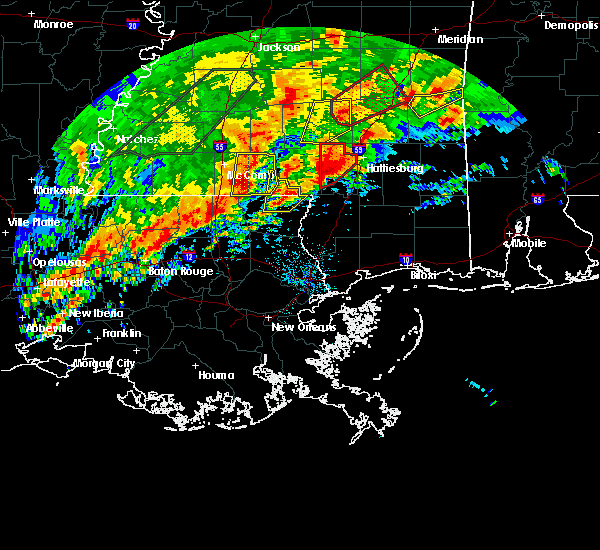 sumrall around 1005 am cst. pinebur around 1010 am cst. baxterville around 1015 am cst. west hattiesburg and rawls springs around 1020 am cst. lumberton around 1025 am cst. purvis around 1030 am cst. 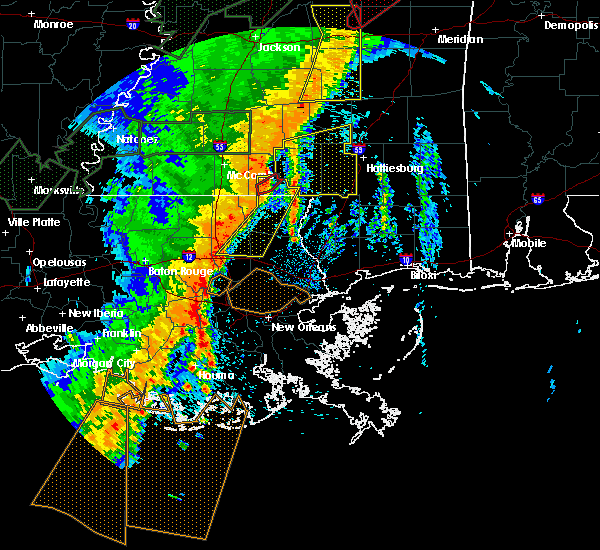 A tornado watch remains in effect until 100 pm cst for south central and southeastern mississippi. 11/1/2018 5:12 AM CDT At 512 am cdt, severe thunderstorms were located along a line extending from near rawls springs to near west hattiesburg to near lumberton, moving east at 30 mph (radar indicated). Hazards include 60 mph wind gusts. Expect damage to roofs, siding, and trees. 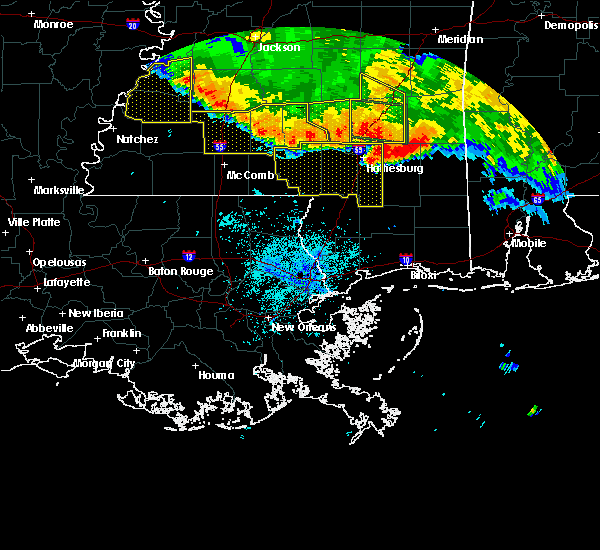 severe thunderstorms will be near, hattiesburg around 515 am cdt. rawls springs around 520 am cdt. petal and rock hill around 535 am cdt. sunrise around 540 am cdt. macedonia and maxie around 545 am cdt. brooklyn and mclaurin around 550 am cdt. other locations impacted by these severe thunderstorms include corinth. 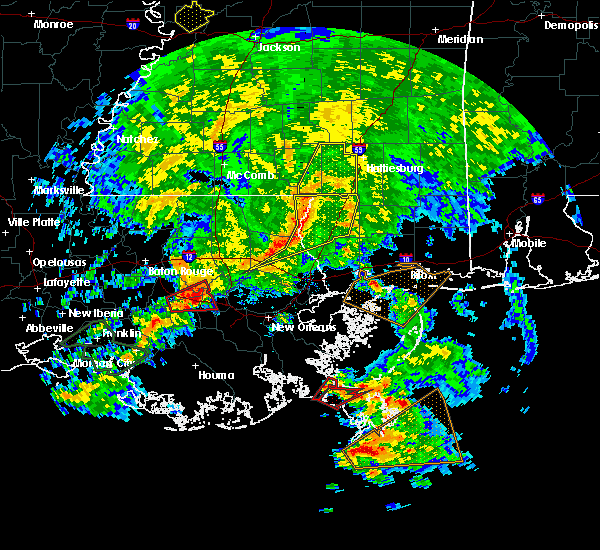 A tornado watch remains in effect until 700 am cdt for southeastern mississippi. 11/1/2018 4:36 AM CDT At 436 am cdt, a severe thunderstorm capable of producing a tornado was located 7 miles west of west hattiesburg, moving northeast at 40 mph (radar indicated rotation). Hazards include tornado. Flying debris will be dangerous to those caught without shelter. mobile homes will be damaged or destroyed. damage to roofs, windows, and vehicles will occur. tree damage is likely. this dangerous storm will be near, hattiesburg and oak grove around 440 am cdt. 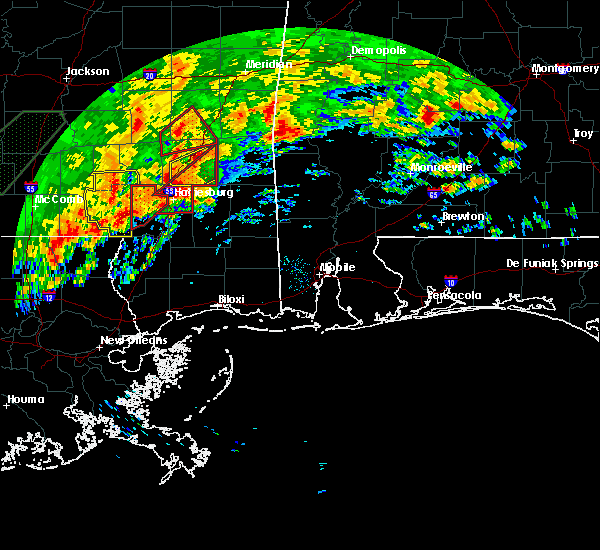 west hattiesburg around 445 am cdt. Rawls springs around 450 am cdt. 11/1/2018 4:19 AM CDT At 419 am cdt, a severe thunderstorm was located 8 miles north of baxterville, or 12 miles southwest of west hattiesburg, moving northeast at 55 mph (radar indicated). Hazards include 60 mph wind gusts. Expect damage to roofs, siding, and trees. 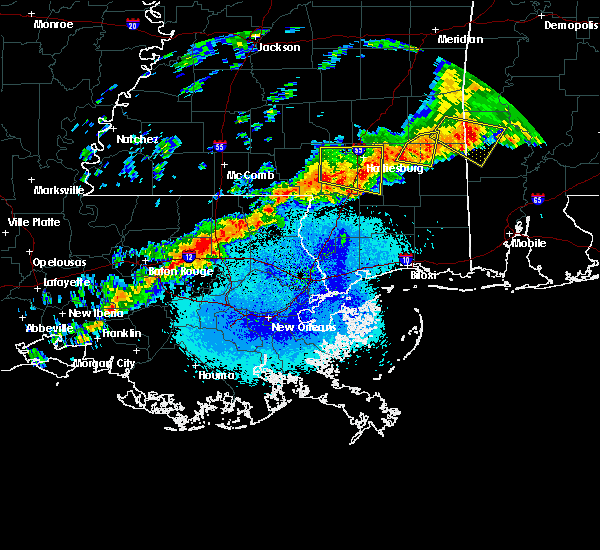 this severe thunderstorm will be near, hattiesburg around 425 am cdt. oak grove around 430 am cdt. west hattiesburg around 435 am cdt. 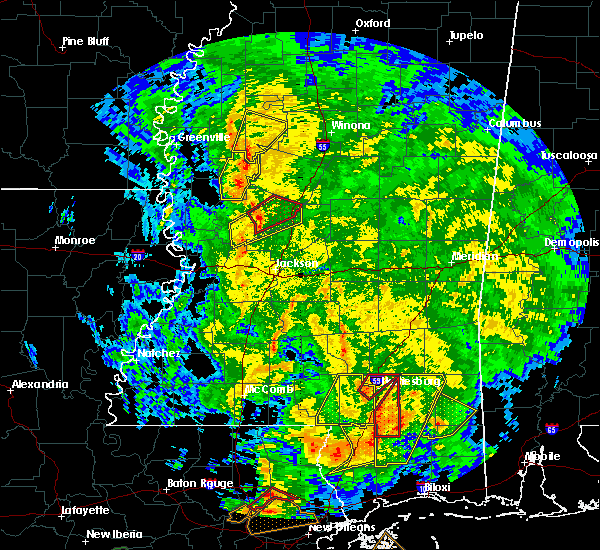 A tornado watch remains in effect until 700 am cdt for southeastern mississippi. 7/19/2018 5:19 PM CDT At 519 pm cdt, a severe thunderstorm was located over rawls springs, or near west hattiesburg, moving south at 15 mph (radar indicated). Hazards include 60 mph wind gusts and quarter size hail. Hail damage to vehicles is expected. expect wind damage to roofs, siding, and trees. 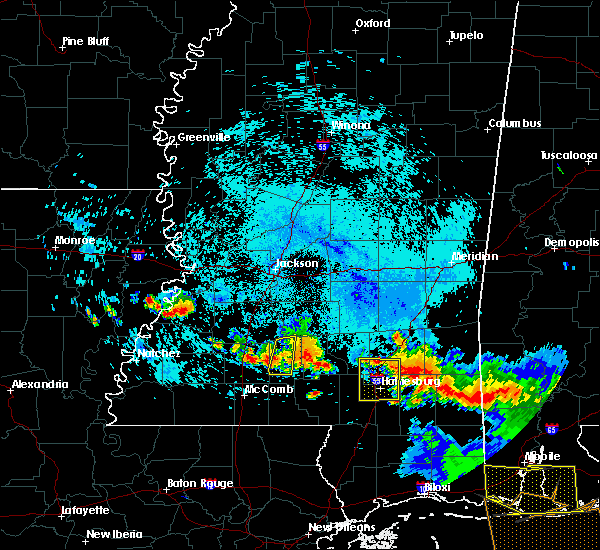 This severe storm will be near, hattiesburg and west hattiesburg around 530 pm cdt. 7/19/2018 4:36 PM CDT At 436 pm cdt, a severe thunderstorm was located near sanford, or 7 miles southeast of collins, moving south at 15 mph (radar indicated). Hazards include 60 mph wind gusts and quarter size hail. Hail damage to vehicles is expected. expect wind damage to roofs, siding, and trees. this severe thunderstorm will be near, sanford around 455 pm cdt. 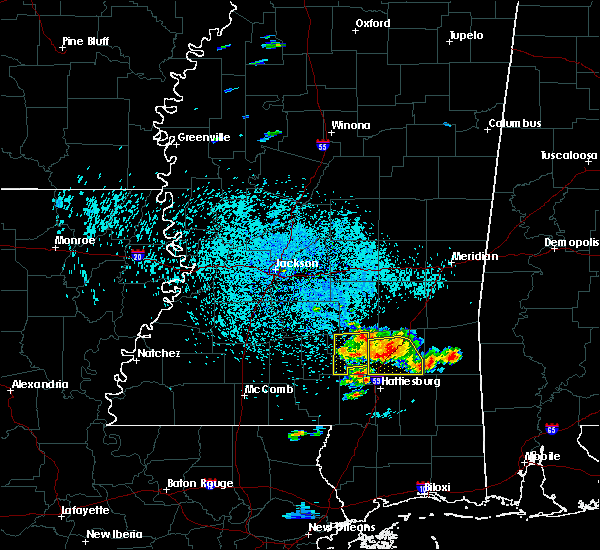 sumrall around 505 pm cdt. rawls springs around 525 pm cdt. 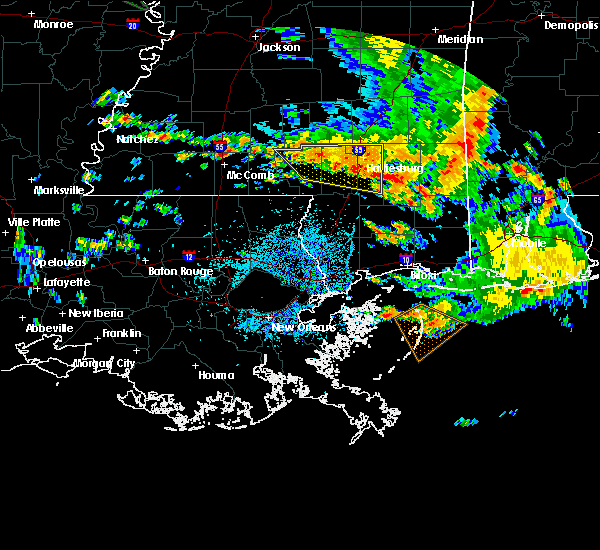 hattiesburg, west hattiesburg and oak grove around 530 pm cdt. Other locations impacted by this severe thunderstorm include seminary. 6/9/2018 6:43 PM CDT At 642 pm cdt, a severe thunderstorm was located near bellevue, and is nearly stationary (radar indicated). Hazards include 60 mph wind gusts. Expect damage to trees. Locations impacted include, oloh, epley and bellevue. 6/9/2018 6:23 PM CDT The national weather service in jackson has issued a * severe thunderstorm warning for. northeastern marion county in south central mississippi. northern lamar county in southeastern mississippi. until 715 pm cdt. At 622 pm cdt, a severe thunderstorm was located near oloh, or 11. 4/14/2018 10:54 AM CDT At 1054 am cdt, a severe thunderstorm was located near sunrise, or 7 miles southeast of petal, moving east at 30 mph (radar indicated). Hazards include 60 mph wind gusts. Expect damage to roofs, siding, and trees. this severe thunderstorm will remain over mainly rural areas of forrest and southeastern lamar counties, including the following locations: corinth. 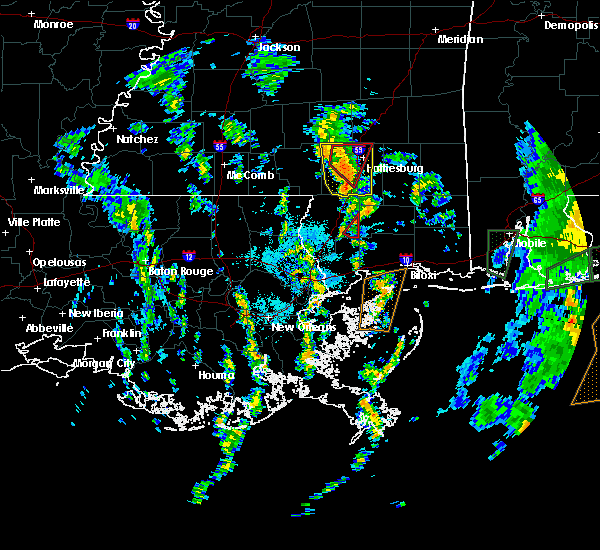 A tornado watch remains in effect until 200 pm cdt for southeastern mississippi. 4/14/2018 10:31 AM CDT At 1031 am cdt, a severe thunderstorm capable of producing a tornado was located near west hattiesburg, moving east at 35 mph (radar indicated rotation). Hazards include tornado. Flying debris will be dangerous to those caught without shelter. mobile homes will be damaged or destroyed. damage to roofs, windows, and vehicles will occur. tree damage is likely. this dangerous storm will be near, hattiesburg, west hattiesburg and oak grove around 1035 am cdt. rawls springs around 1040 am cdt. petal and sunrise around 1050 am cdt. macedonia around 1100 am cdt. Other locations impacted by this tornadic thunderstorm include corinth. 4/14/2018 10:27 AM CDT At 1027 am cdt, a severe thunderstorm was located near west hattiesburg, moving east at 30 mph (radar indicated). Hazards include 60 mph wind gusts. Expect damage to roofs, siding, and trees. this severe storm will be near, hattiesburg, west hattiesburg and oak grove around 1030 am cdt. petal and mclaurin around 1045 am cdt. sunrise around 1050 am cdt. macedonia around 1055 am cdt. other locations impacted by this severe thunderstorm include corinth. 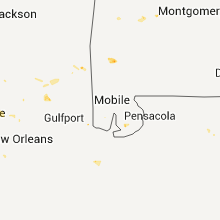 A tornado watch remains in effect until 200 pm cdt for southeastern mississippi. 4/14/2018 10:21 AM CDT At 1021 am cdt, a severe thunderstorm capable of producing a tornado was located 9 miles southwest of west hattiesburg, moving northeast at 35 mph (radar indicated rotation). Hazards include tornado. Flying debris will be dangerous to those caught without shelter. mobile homes will be damaged or destroyed. damage to roofs, windows, and vehicles will occur. tree damage is likely. this dangerous storm will be near, hattiesburg around 1025 am cdt. oak grove around 1030 am cdt. west hattiesburg around 1035 am cdt. rawls springs around 1040 am cdt. 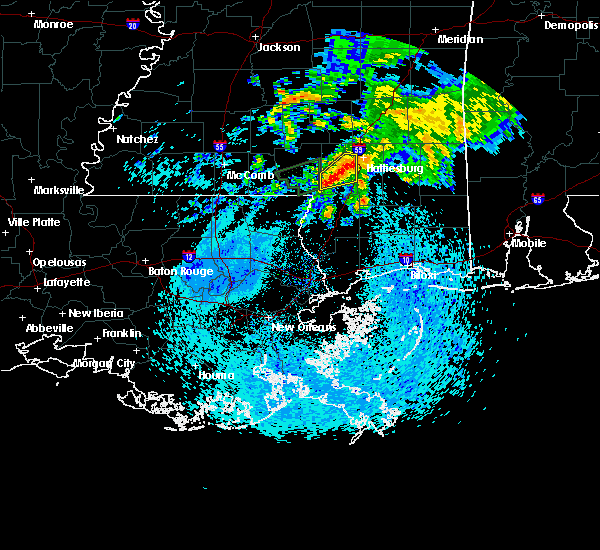 petal and sunrise around 1050 am cdt. macedonia around 1100 am cdt. Other locations impacted by this tornadic thunderstorm include corinth. 4/14/2018 10:10 AM CDT At 1010 am cdt, a severe thunderstorm capable of producing a tornado was located 7 miles northeast of pinebur, or 13 miles east of columbia, moving east at 35 mph (radar indicated rotation). Hazards include tornado. Flying debris will be dangerous to those caught without shelter. mobile homes will be damaged or destroyed. damage to roofs, windows, and vehicles will occur. tree damage is likely. this dangerous storm will be near, hattiesburg and purvis around 1025 am cdt. oak grove around 1030 am cdt. west hattiesburg around 1035 am cdt. rawls springs around 1040 am cdt. 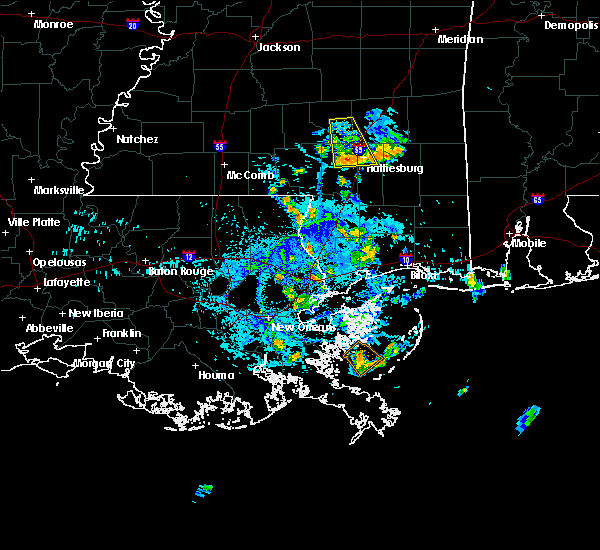 petal and sunrise around 1050 am cdt. macedonia around 1100 am cdt. Other locations impacted by this tornadic thunderstorm include corinth. 4/14/2018 9:54 AM CDT At 954 am cdt, a severe thunderstorm was located near pinebur, or near columbia, moving east at 30 mph (radar indicated). Hazards include 60 mph wind gusts. Expect damage to roofs, siding, and trees. 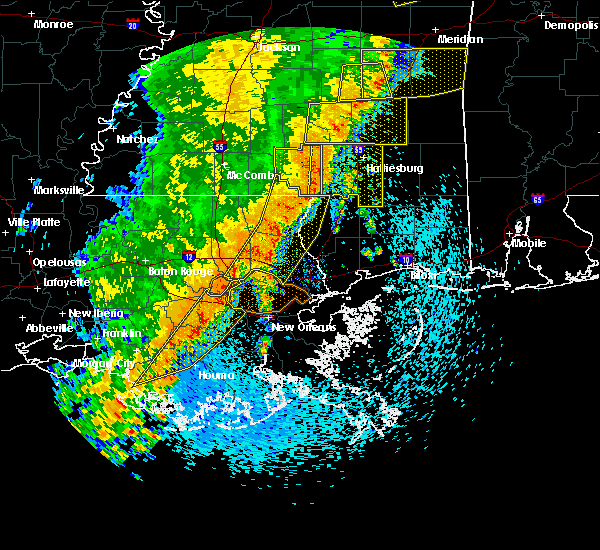 this severe thunderstorm will be near, hattiesburg around 1020 am cdt. purvis and pine ridge around 1025 am cdt. west hattiesburg and oak grove around 1030 am cdt. 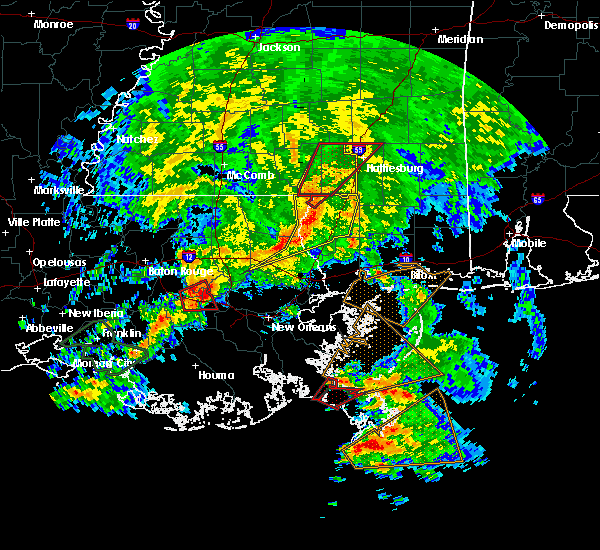 petal around 1045 am cdt. sunrise and mclaurin around 1050 am cdt. macedonia around 1055 am cdt. other locations impacted by this severe thunderstorm include corinth. 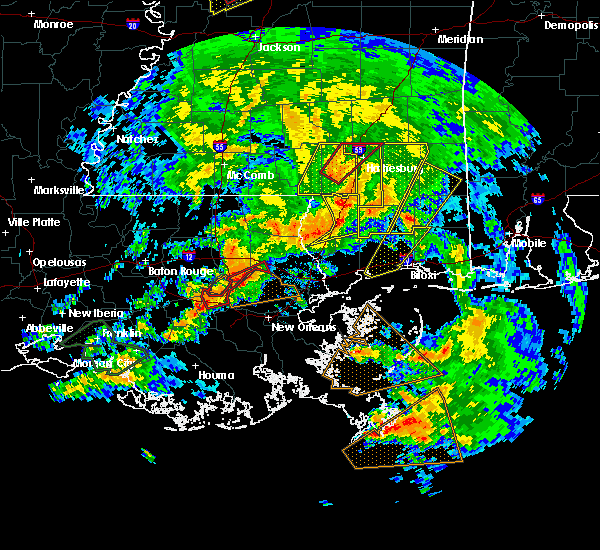 A tornado watch remains in effect until 200 pm cdt for south central and southeastern mississippi. 8/30/2017 11:09 AM CDT At 1108 am cdt, a severe thunderstorm capable of producing a tornado was located over sanford, or 12 miles southeast of collins, moving north at 30 mph (radar indicated rotation). Hazards include tornado. Flying debris will be dangerous to those caught without shelter. mobile homes will be damaged or destroyed. damage to roofs, windows, and vehicles will occur. tree damage is likely. this dangerous storm will be near, collins around 1130 am cdt. hebron around 1140 am cdt. Other locations impacted by this tornadic thunderstorm include seminary. 8/30/2017 10:43 AM CDT At 1042 am cdt, a severe thunderstorm capable of producing a tornado was located near west hattiesburg, moving north at 30 mph (radar indicated rotation). Hazards include tornado. Flying debris will be dangerous to those caught without shelter. mobile homes will be damaged or destroyed. damage to roofs, windows, and vehicles will occur. tree damage is likely. this dangerous storm will be near, hattiesburg and oak grove around 1050 am cdt. west hattiesburg around 1055 am cdt. rawls springs around 1100 am cdt. eastabuchie around 1110 am cdt. sanford around 1115 am cdt. moselle around 1120 am cdt. ellisville around 1135 am cdt. hebron around 1145 am cdt. Other locations impacted by this tornadic thunderstorm include seminary. 8/30/2017 10:32 AM CDT At 1032 am cdt, a severe thunderstorm capable of producing a tornado was located over purvis, or 11 miles south of west hattiesburg, moving north at 30 mph (radar indicated rotation). Hazards include tornado. Flying debris will be dangerous to those caught without shelter. mobile homes will be damaged or destroyed. damage to roofs, windows, and vehicles will occur. tree damage is likely. This dangerous storm will be near, hattiesburg, west hattiesburg and oak grove around 1045 am cdt. 8/30/2017 10:19 AM CDT At 1019 am cdt, a severe thunderstorm capable of producing a tornado was located near west hattiesburg, moving north at 30 mph (radar indicated rotation). Hazards include tornado. Flying debris will be dangerous to those caught without shelter. mobile homes will be damaged or destroyed. damage to roofs, windows, and vehicles will occur. tree damage is likely. this dangerous storm will be near, hattiesburg and oak grove around 1025 am cdt. west hattiesburg around 1030 am cdt. Rawls springs around 1040 am cdt. 8/30/2017 10:05 AM CDT At 1005 am cdt, a severe thunderstorm capable of producing a tornado was located near purvis, or 12 miles southwest of west hattiesburg, moving north at 35 mph (radar indicated rotation). Hazards include tornado. Flying debris will be dangerous to those caught without shelter. mobile homes will be damaged or destroyed. damage to roofs, windows, and vehicles will occur. tree damage is likely. this dangerous storm will be near, hattiesburg and oak grove around 1020 am cdt. west hattiesburg around 1025 am cdt. Rawls springs around 1035 am cdt. 8/30/2017 10:01 AM CDT At 1000 am cdt, a severe thunderstorm was located near purvis, or 16 miles southwest of west hattiesburg, moving north at 35 mph (radar indicated). Hazards include 60 mph wind gusts. Expect damage to roofs, siding, and trees. this severe storm will be near, purvis around 1010 am cdt. hattiesburg and oak grove around 1025 am cdt. west hattiesburg around 1030 am cdt. 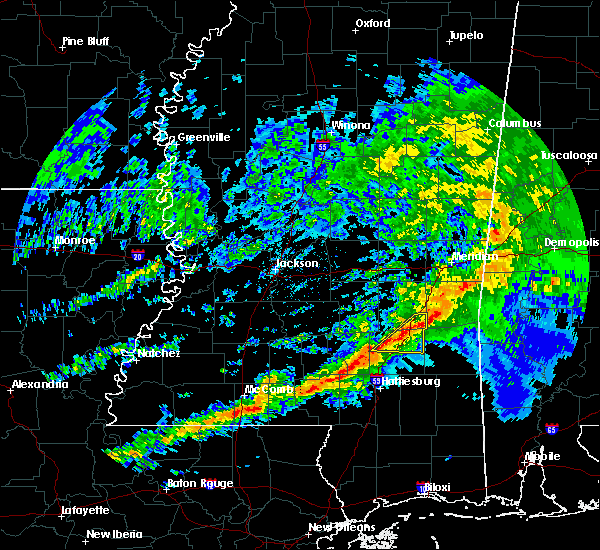 Petal and rawls springs around 1040 am cdt. 8/30/2017 9:50 AM CDT At 950 am cdt, a severe thunderstorm was located near baxterville, or 14 miles north of poplarville, moving north at 35 mph (radar indicated). Hazards include 60 mph wind gusts. Expect damage to roofs, siding, and trees. this severe thunderstorm will be near, pine ridge around 1010 am cdt. hattiesburg and oak grove around 1020 am cdt. 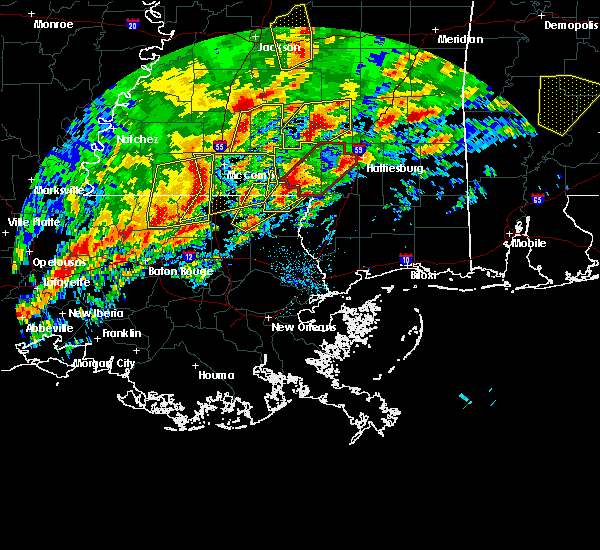 Sumrall around 1035 am cdt. 6/16/2017 9:45 PM CDT At 945 pm cdt, severe thunderstorms were located along a line extending from hattiesburg to columbia, moving south at 50 mph (radar indicated). Hazards include 70 mph wind gusts. Expect considerable tree damage. damage is likely to mobile homes, roofs, and outbuildings. these severe storms will be near, sunrise around 950 pm cdt. mclaurin, pickwick and pinebur around 955 pm cdt. rock hill around 1000 pm cdt. sandy hook and brooklyn around 1005 pm cdt. maxie around 1015 pm cdt. Other locations impacted by these severe thunderstorms include corinth. 6/16/2017 9:33 PM CDT At 932 pm cdt, severe thunderstorms were located along a line extending from near moselle to near society hill, moving southeast at 50 mph (radar indicated). Hazards include 70 mph wind gusts. Expect considerable tree damage. damage is likely to mobile homes, roofs, and outbuildings. 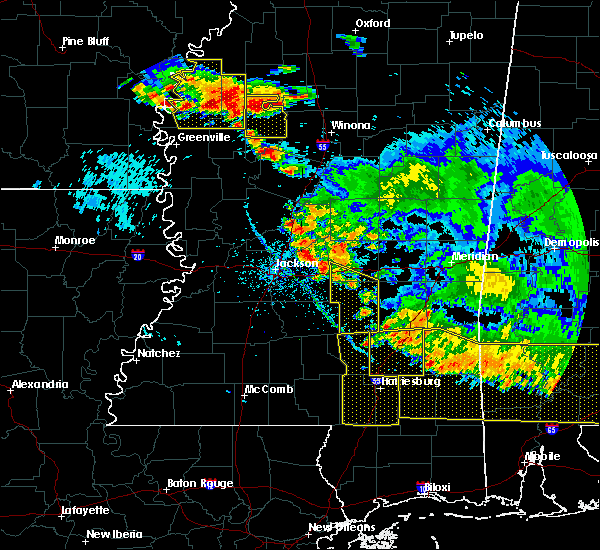 these severe storms will be near, west hattiesburg and rawls springs around 940 pm cdt. 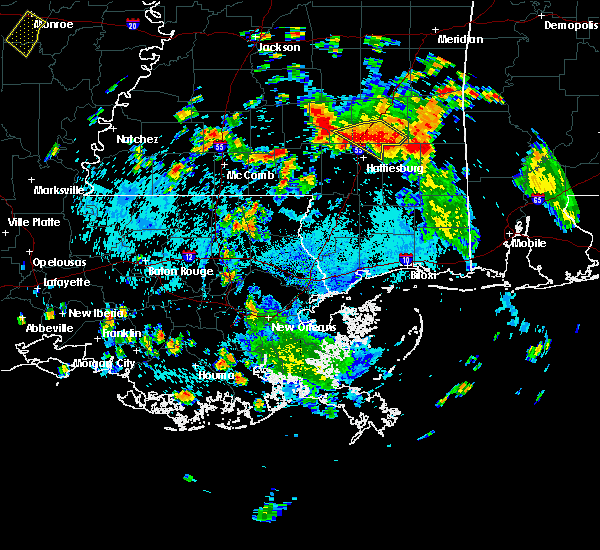 petal and macedonia around 945 pm cdt. sunrise around 950 pm cdt. pickwick around 955 pm cdt. sandy hook, pinebur and mclaurin around 1000 pm cdt. baxterville around 1005 pm cdt. Other locations impacted by these severe thunderstorms include corinth. 6/16/2017 9:13 PM CDT At 913 pm cdt, severe thunderstorms were located along a line extending from collins to near monticello, moving south at 55 mph (radar indicated). Hazards include 70 mph wind gusts. Expect considerable tree damage. damage is likely to mobile homes, roofs, and outbuildings. 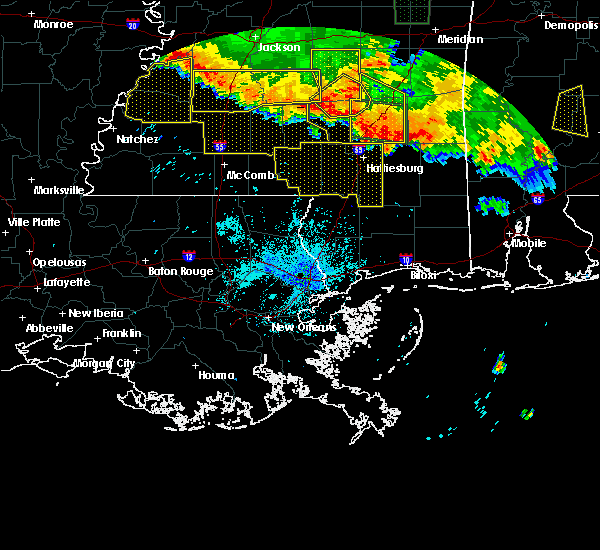 severe thunderstorms will be near, sumrall around 930 pm cdt. holly springs and morgantown around 935 pm cdt. 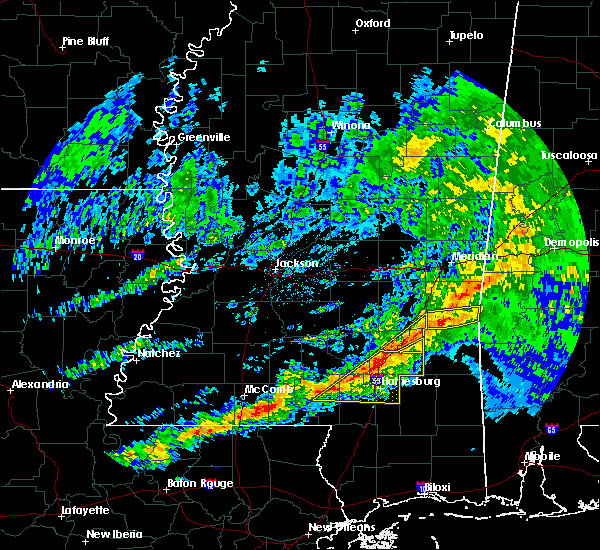 west hattiesburg and rawls springs around 940 pm cdt. 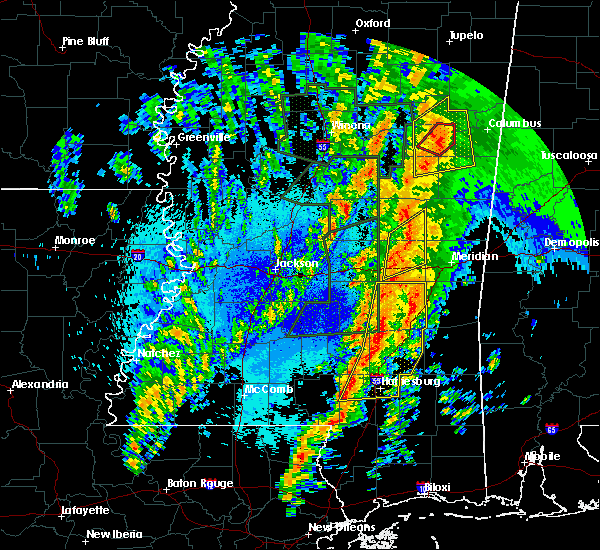 hattiesburg, kokomo and oak grove around 945 pm cdt. pine ridge around 950 pm cdt. purvis around 955 pm cdt. rock hill around 1000 pm cdt. lumberton around 1005 pm cdt. Other locations impacted by these severe thunderstorms include corinth. 4/30/2017 8:11 PM CDT At 810 pm cdt, a severe thunderstorm was located over petal, moving northeast at 70 mph (radar indicated). Hazards include 60 mph wind gusts and quarter size hail. Hail damage to vehicles is expected. expect wind damage to roofs, siding, and trees. This severe storm will be near, macedonia around 815 pm cdt. 4/30/2017 8:00 PM CDT At 800 pm cdt, a severe thunderstorm was located near purvis, or 9 miles south of west hattiesburg, moving northeast at 60 mph (radar indicated). Hazards include 60 mph wind gusts and quarter size hail. Hail damage to vehicles is expected. expect wind damage to roofs, siding, and trees. this severe thunderstorm will be near, hattiesburg and oak grove around 805 pm cdt. west hattiesburg around 810 pm cdt. petal, rawls springs and sunrise around 815 pm cdt. Macedonia around 820 pm cdt. 4/30/2017 11:08 AM CDT At 1107 am cdt, severe thunderstorms were located along a line extending from near soso to near lumberton, moving east at 20 mph (radar indicated). Hazards include 60 mph wind gusts. Expect damage to roofs, siding, and trees. locations impacted include, hattiesburg, laurel, petal, ellisville, west hattiesburg, purvis, lumberton, sandersville, rawls springs, brooklyn, maxie, eastabuchie, ovett, rock hill, mill creek, mclaurin, tuckers crossing, sunrise, macedonia and moselle. A tornado watch remains in effect until 300 pm cdt for southeastern and east central mississippi. 4/30/2017 10:54 AM CDT At 1052 am cdt, severe thunderstorms were located along a line extending from 8 miles southeast of taylorsville to near lumberton, moving east at 30 mph (radar indicated. marion county sheriffs office reported trees downed across the county with these storms). Hazards include 60 mph wind gusts. Expect damage to roofs, siding, and trees. locations impacted include, hattiesburg, laurel, petal, ellisville, west hattiesburg, purvis, lumberton, sandersville, brooklyn, maxie, rock hill, sanford, tuckers crossing, rawls springs, eastabuchie, ovett, mill creek, mclaurin, sunrise and macedonia. A tornado watch remains in effect until 300 pm cdt for central, southeastern and east central mississippi. 4/30/2017 10:37 AM CDT At 1037 am cdt, severe thunderstorms were located along a line extending from seminary to bellevue to 6 miles east of sandy hook, moving east at 45 mph (radar indicated). Hazards include 60 mph wind gusts. Expect damage to roofs, siding, and trees. 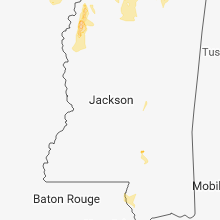 locations impacted include, hattiesburg, columbia, kokomo, sandy hook, west hattiesburg, holly springs, purvis, lumberton, sumrall, morgantown, goss, bunker hill, pickwick, sanford, pineburr, society hill, improve, baxterville, melba and seminary. A tornado watch remains in effect until 300 pm cdt for south central and southeastern mississippi. 4/30/2017 9:50 AM CDT At 949 am cdt, severe thunderstorms were located along a line extending from near salem to near dexter, moving east at 45 mph (radar indicated). Hazards include 60 mph wind gusts. Expect damage to roofs, siding, and trees. severe thunderstorms will be near, holly springs around 1000 am cdt. goss and morgantown around 1005 am cdt. sandy hook, society hill and pickwick around 1010 am cdt. bunker hill around 1015 am cdt. pinebur and improve around 1020 am cdt. baxterville around 1025 am cdt. melba around 1030 am cdt. 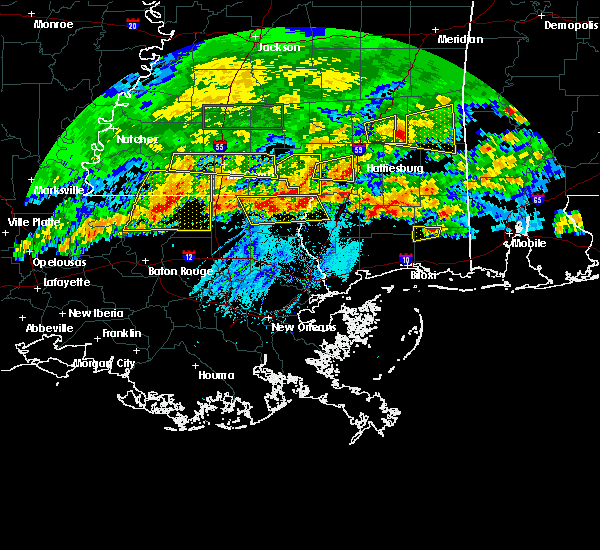 sumrall around 1035 am cdt. other locations impacted by these severe thunderstorms include bassfield and seminary. 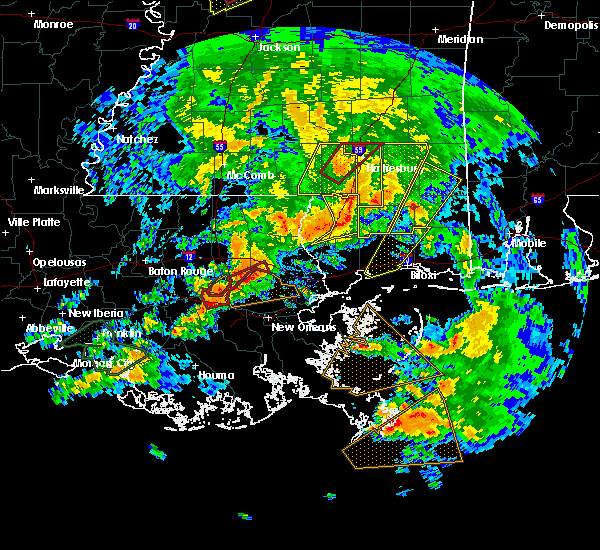 A tornado watch remains in effect until 300 pm cdt for south central and southeastern mississippi. 4/22/2017 9:06 PM CDT The severe thunderstorm warning for forrest and lamar counties will expire at 915 pm cdt, the storm which prompted the warning has weakened below severe limits, and no longer poses an immediate threat to life or property. therefore the warning will be allowed to expire. however gusty winds are still possible with this thunderstorm. 4/22/2017 8:31 PM CDT At 831 pm cdt, a severe thunderstorm was located 10 miles northwest of purvis, or 12 miles southwest of west hattiesburg, moving east at 30 mph (radar indicated). Hazards include 60 mph wind gusts and quarter size hail. Hail damage to vehicles is expected. expect wind damage to roofs, siding, and trees. this severe thunderstorm will be near, hattiesburg around 840 pm cdt. oak grove around 845 pm cdt. purvis around 850 pm cdt. rock hill around 900 pm cdt. mclaurin around 910 pm cdt. Brooklyn around 915 pm cdt. 4/3/2017 4:32 AM CDT At 431 am cdt, a severe thunderstorm was located near west hattiesburg, moving northeast at 50 mph (radar indicated). Hazards include 60 mph wind gusts. Expect damage to roofs, siding, and trees. this severe storm will be near, oak grove and rawls springs around 435 am cdt. petal around 440 am cdt. sunrise and macedonia around 445 am cdt. other locations impacted by this severe thunderstorm include corinth. 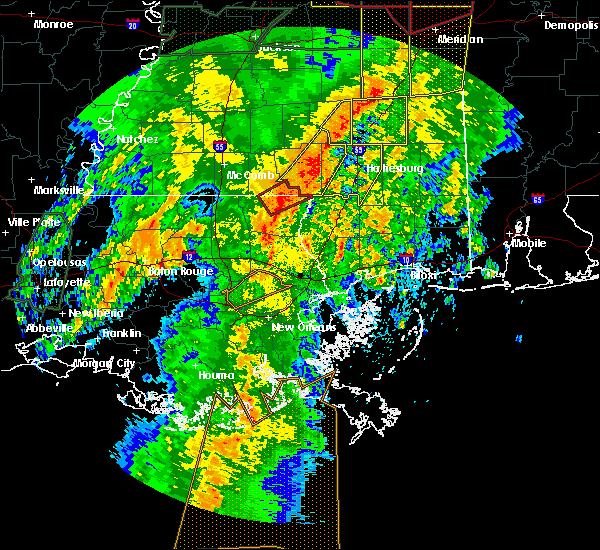 A tornado watch remains in effect until 900 am cdt for southeastern mississippi. 4/3/2017 4:05 AM CDT At 404 am cdt, a severe thunderstorm was located over pinebur, or 10 miles northeast of sandy hook, moving northeast at 60 mph (radar indicated). Hazards include 60 mph wind gusts and penny size hail. Expect damage to roofs, siding, and trees. this severe thunderstorm will be near, hattiesburg, purvis and pine ridge around 420 am cdt. 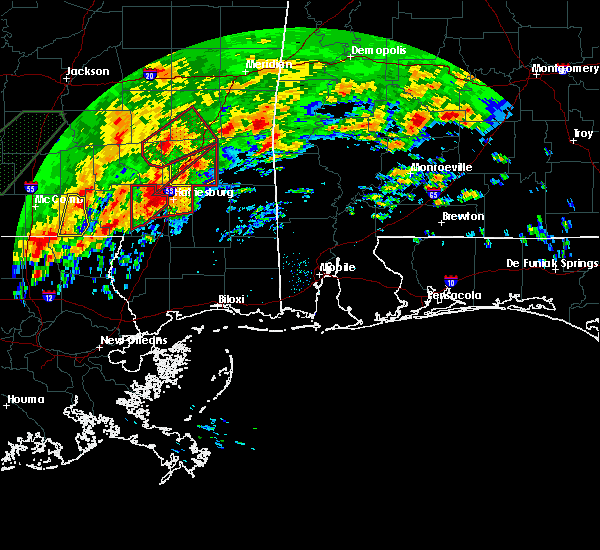 west hattiesburg and oak grove around 425 am cdt. rawls springs around 430 am cdt. petal and sunrise around 435 am cdt. macedonia around 440 am cdt. other locations impacted by this severe thunderstorm include corinth. 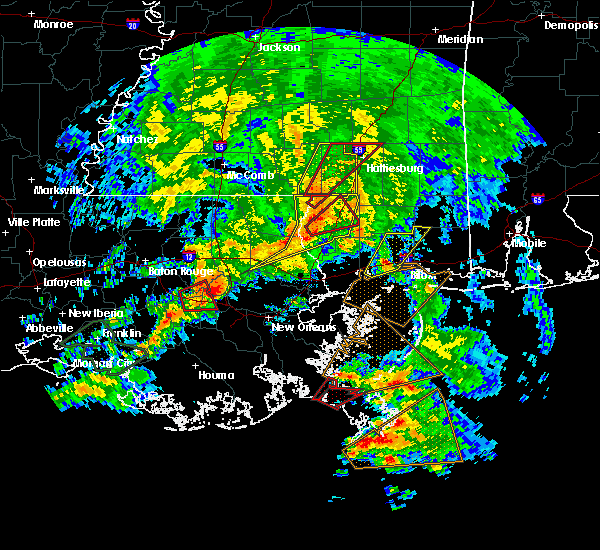 A tornado watch remains in effect until 900 am cdt for southeastern mississippi. 3/30/2017 6:12 AM CDT At 612 am cdt, a severe thunderstorm was located near macedonia, or 8 miles east of petal, moving northeast at 45 mph (radar indicated). Hazards include 60 mph wind gusts and quarter size hail. Hail damage to vehicles is expected. expect wind damage to roofs, siding, and trees. This severe storm will be near, ovett around 625 am cdt. 3/30/2017 5:39 AM CDT At 538 am cdt, a severe thunderstorm was located near purvis, or 12 miles southwest of west hattiesburg, moving northeast at 45 mph (radar indicated). Hazards include 60 mph wind gusts and quarter size hail. Hail damage to vehicles is expected. expect wind damage to roofs, siding, and trees. 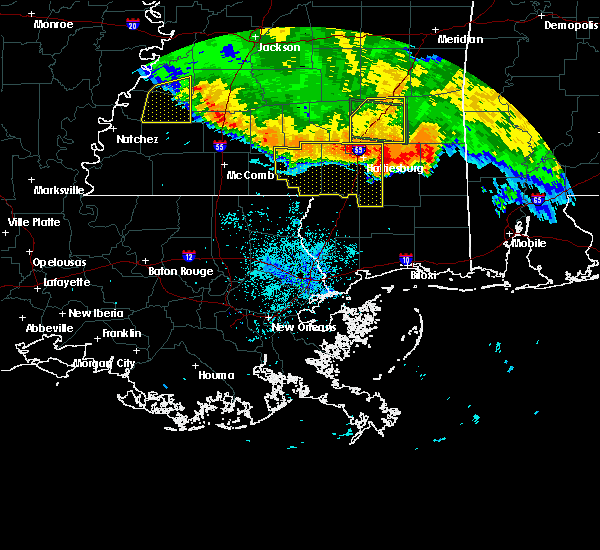 this severe thunderstorm will be near, hattiesburg around 545 am cdt. oak grove around 550 am cdt. 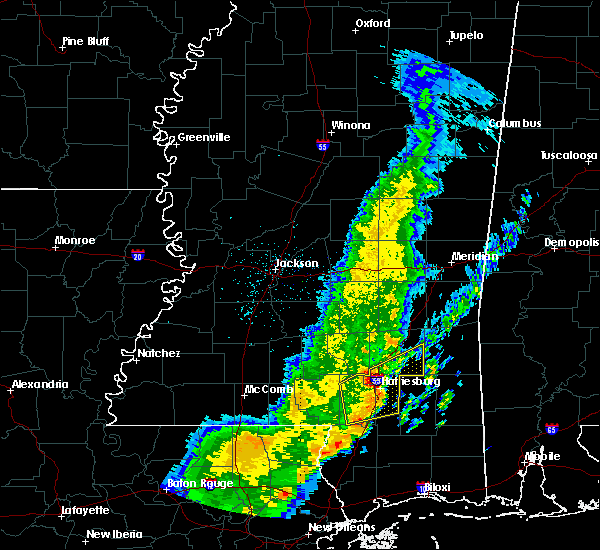 west hattiesburg around 555 am cdt. petal and sunrise around 605 am cdt. macedonia around 610 am cdt. Ovett around 625 am cdt. 3/1/2017 6:12 PM CST At 612 pm cst, a severe thunderstorm was located near west hattiesburg, moving east at 50 mph (radar indicated). Hazards include 60 mph wind gusts and quarter size hail. Hail damage to vehicles is expected. expect wind damage to roofs, siding, and trees. this severe thunderstorm will be near, oak grove around 620 pm cst. Petal, sunrise and mclaurin around 625 pm cst. 1/21/2017 3:57 AM CST At 357 am cst, a severe thunderstorm capable of producing a tornado was located 7 miles northeast of pinebur, or 13 miles east of columbia, moving northeast at 45 mph (radar indicated rotation). Hazards include tornado and quarter size hail. Flying debris will be dangerous to those caught without shelter. mobile homes will be damaged or destroyed. damage to roofs, windows, and vehicles will occur. tree damage is likely. this dangerous storm will be near, hattiesburg around 410 am cst. West hattiesburg and oak grove around 415 am cst. 1/21/2017 3:46 AM CST At 345 am cst, a confirmed tornado was located over west hattiesburg, moving northeast at 50 mph (radar confirmed tornado). Hazards include damaging tornado and quarter size hail. Flying debris will be dangerous to those caught without shelter. mobile homes will be damaged or destroyed. damage to roofs, windows, and vehicles will occur. tree damage is likely. this tornado will be near, petal and sunrise around 355 am cst. macedonia and eastabuchie around 400 am cst. ovett around 415 am cst. mill creek around 430 am cst. Other locations impacted by this tornadic thunderstorm include rhodes, pineview and corinth. 1/21/2017 3:36 AM CST At 336 am cst, a severe thunderstorm capable of producing a tornado was located 7 miles northwest of purvis, or 8 miles southwest of west hattiesburg, moving northeast at 45 mph (radar indicated rotation). Hazards include tornado. Flying debris will be dangerous to those caught without shelter. mobile homes will be damaged or destroyed. damage to roofs, windows, and vehicles will occur. tree damage is likely. this dangerous storm will be near, hattiesburg around 340 am cst. rawls springs around 355 am cst. petal, eastabuchie and sunrise around 400 am cst. macedonia around 405 am cst. ovett around 420 am cst. tuckers crossing around 425 am cst. mill creek around 430 am cst. Other locations impacted by this tornadic thunderstorm include rhodes, pineview and corinth. 1/21/2017 3:26 AM CST At 326 am cst, a severe thunderstorm capable of producing a tornado was located near baxterville, or 15 miles southeast of columbia, moving northeast at 45 mph (radar indicated rotation). Hazards include tornado and quarter size hail. Flying debris will be dangerous to those caught without shelter. mobile homes will be damaged or destroyed. damage to roofs, windows, and vehicles will occur. tree damage is likely. this dangerous storm will be near, hattiesburg around 340 am cst. oak grove around 345 am cst. West hattiesburg around 350 am cst. 1/21/2017 2:57 AM CST At 256 am cst, a severe thunderstorm capable of producing a tornado was located near sandy hook, moving northeast at 65 mph (radar indicated rotation). Hazards include tornado and quarter size hail. Flying debris will be dangerous to those caught without shelter. mobile homes will be damaged or destroyed. damage to roofs, windows, and vehicles will occur. tree damage is likely. this dangerous storm will be near, sandy hook and pickwick around 305 am cst. pinebur around 310 am cst. 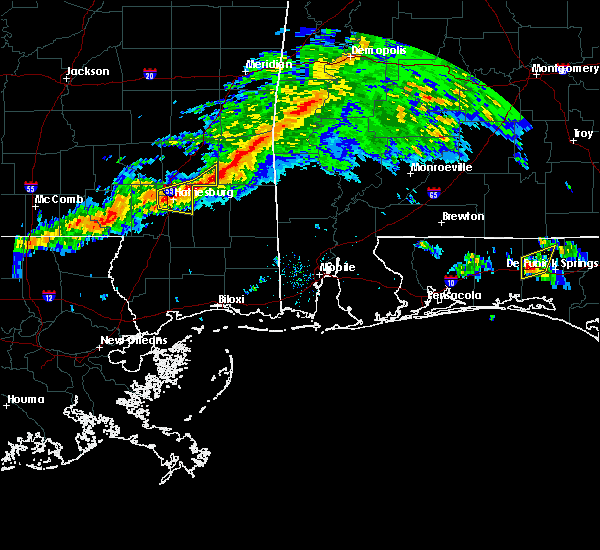 hattiesburg around 325 am cst. 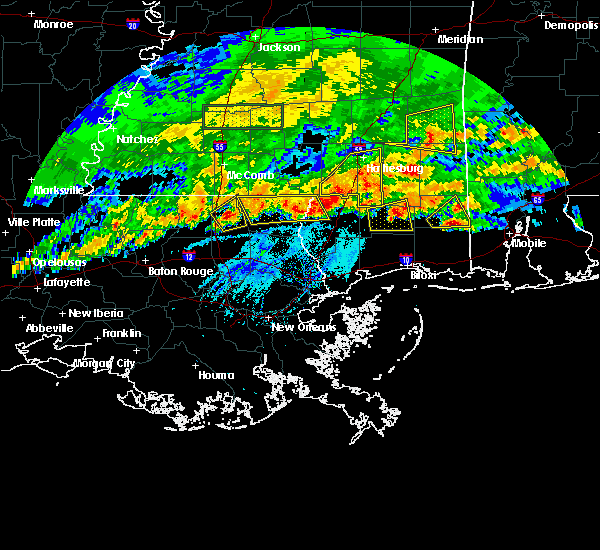 West hattiesburg, sumrall and oak grove around 330 am cst. 1/2/2017 2:39 PM CST At 239 pm cst, a severe thunderstorm was located near pinebur, or 12 miles northeast of sandy hook, moving east at 60 mph (radar indicated). Hazards include 60 mph wind gusts. Expect damage to roofs, siding, and trees. this severe thunderstorm will be near, hattiesburg and purvis around 250 pm cst. oak grove around 255 pm cst. west hattiesburg and mclaurin around 300 pm cst. petal and sunrise around 305 pm cst. macedonia around 310 pm cst. 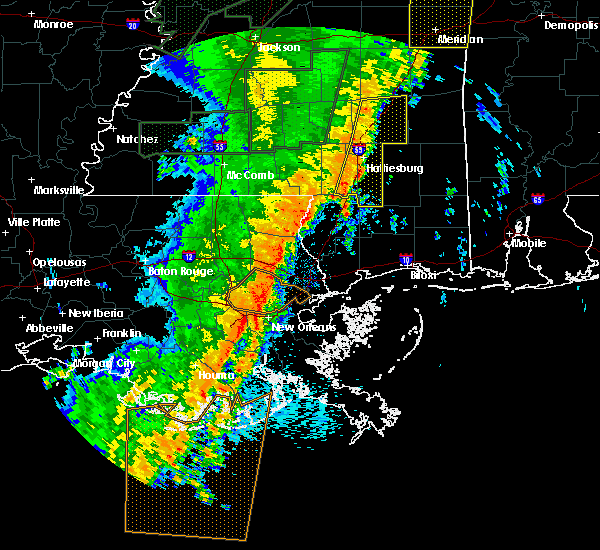 A tornado watch remains in effect until 800 pm cst for southeastern mississippi. 9/25/2016 5:59 PM CDT At 559 pm cdt, a severe thunderstorm was located over west hattiesburg, moving west at 10 mph (radar indicated). Hazards include 60 mph wind gusts and quarter size hail. Hail damage to vehicles is expected. expect wind damage to roofs, siding, and trees. This severe thunderstorm will remain over mainly rural areas of northwestern forrest and northeastern lamar counties. 7/22/2016 3:00 PM CDT At 300 pm cdt, severe thunderstorms were located along a line extending from sunrise to near sumrall, moving southwest at 20 mph (radar indicated). Hazards include 60 mph wind gusts. Expect damage to roofs. siding. and trees. Locations impacted include, hattiesburg, petal, west hattiesburg, sumrall, macedonia, sunrise and rawls springs. 7/22/2016 2:27 PM CDT At 226 pm cdt, severe thunderstorms were located along a line extending from near macedonia to near sanford, moving southwest at 20 mph (radar indicated. at 207 pm, several downed trees were reported between ellisville and ovett). Hazards include 60 mph wind gusts. Expect damage to roofs. siding. And trees. 6/17/2016 6:48 PM CDT At 648 pm cdt, severe thunderstorms were located along a line extending from near sanford to near sunrise, moving south at 35 mph (radar indicated). Hazards include 60 mph wind gusts. Expect damage to roofs. siding. and trees. these severe storms will be near, mclaurin around 655 pm cdt. rawls springs around 705 pm cdt. brooklyn around 710 pm cdt. 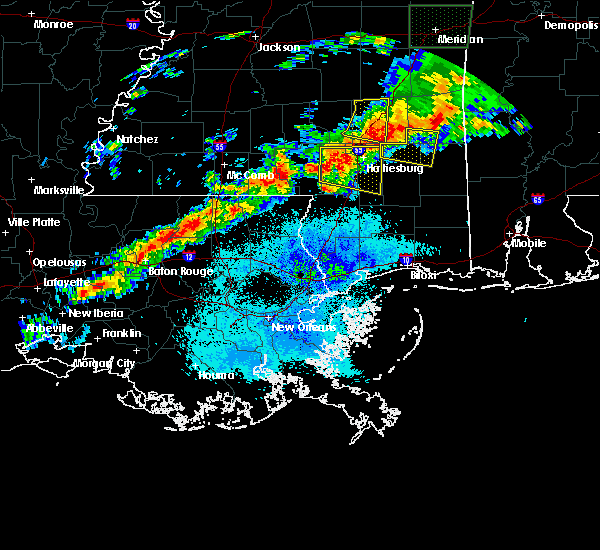 hattiesburg, west hattiesburg, oak grove and pine ridge around 715 pm cdt. Other locations impacted by these severe thunderstorms include seminary. 6/17/2016 6:12 PM CDT At 612 pm cdt, severe thunderstorms were located along a line extending from 6 miles southwest of taylorsville to near moselle, moving south at 45 mph (radar indicated). Hazards include 60 mph wind gusts. Expect damage to roofs. siding. and trees. severe thunderstorms will be near, macedonia around 620 pm cdt. 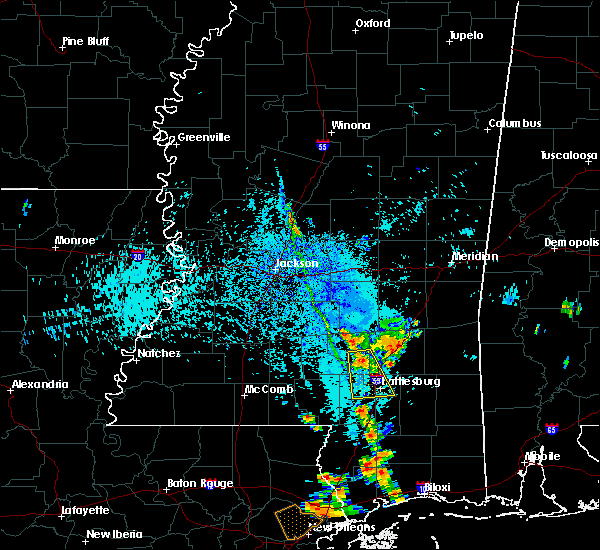 petal around 625 pm cdt. sunrise around 630 pm cdt. sanford around 635 pm cdt. mclaurin around 640 pm cdt. 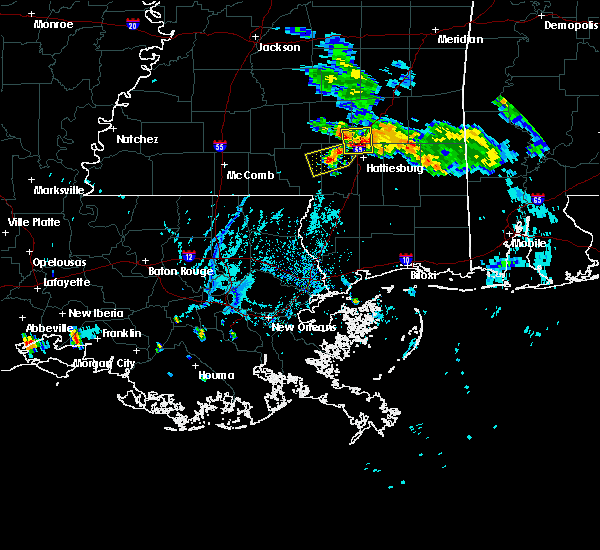 sumrall around 645 pm cdt. rock hill around 650 pm cdt. 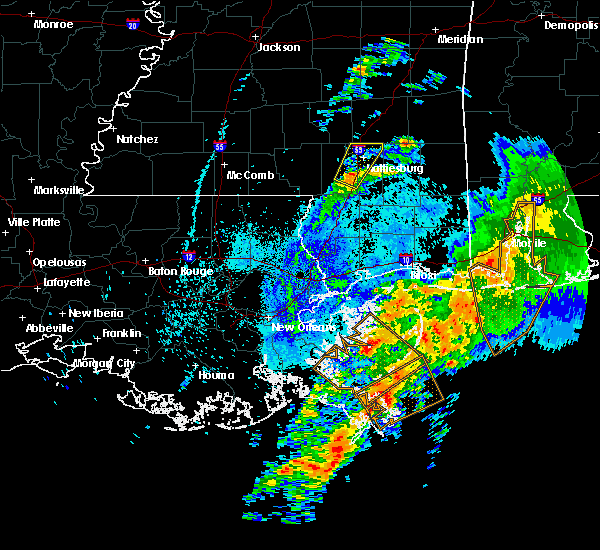 hattiesburg, brooklyn and oak grove around 655 pm cdt. Other locations impacted by these severe thunderstorms include seminary. 3/31/2016 7:45 AM CDT At 744 am cdt, a severe thunderstorm was located west of purvis, or 13 miles southwest of west hattiesburg, moving east at 35 mph (radar indicated). Hazards include 60 mph wind gusts and nickel size hail. Expect damage to roofs. siding and trees. locations impacted include, hattiesburg, west hattiesburg, purvis and baxterville. 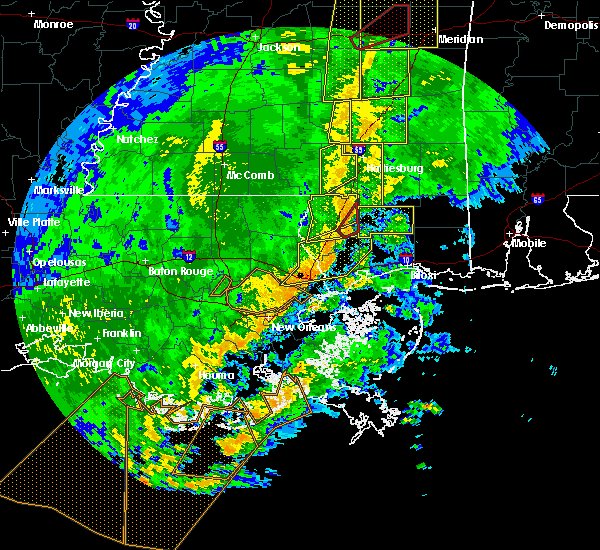 A tornado watch remains in effect until 900 am cdt for southeastern mississippi. 3/31/2016 7:38 AM CDT At 738 am cdt, a severe thunderstorm was located near baxterville, or 16 miles northeast of sandy hook, moving east at 35 mph (radar indicated). Hazards include 60 mph wind gusts and nickel size hail. Expect damage to roofs. siding and trees. locations impacted include, hattiesburg, west hattiesburg, purvis, baxterville and pinebur. 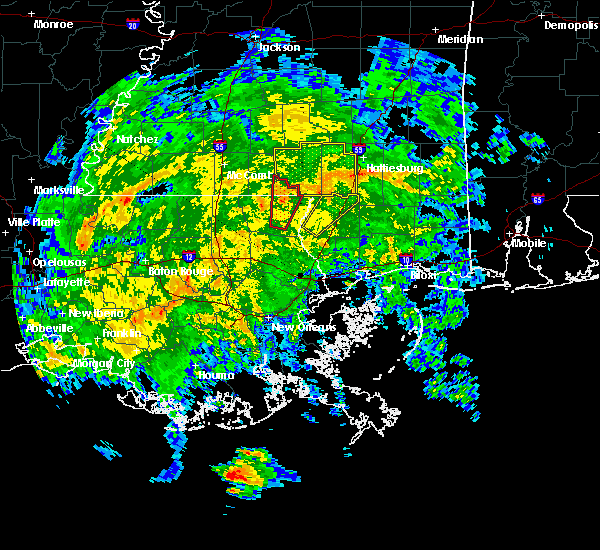 A tornado watch remains in effect until 900 am cdt for southeastern mississippi. 3/31/2016 7:26 AM CDT At 726 am cdt, a severe thunderstorm was located over pineburr, or 7 miles northeast of sandy hook, moving northeast at 35 mph (radar indicated). Hazards include 60 mph wind gusts. Expect damage to roofs. Siding and trees. 3/17/2016 6:17 PM CDT At 617 pm cdt, severe thunderstorms were located along a line extending from near west hattiesburg to near lumberton, moving east at 40 mph (radar indicated). Hazards include 60 mph wind gusts. Expect damage to roofs. siding and trees. Locations impacted include, hattiesburg, petal, west hattiesburg, purvis, lumberton, brooklyn, sunrise, maxie, macedonia, rock hill, baxterville and mclaurin. 3/17/2016 6:10 PM CDT At 609 pm cdt, severe thunderstorms were located along a line extending from near sumrall to 8 miles southwest of baxterville, moving east at 30 mph (trained weather spotters. trees and powerlines were downed by these storms in marion county). Hazards include 60 mph wind gusts. Expect damage to roofs. siding and trees. 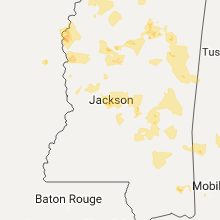 Locations impacted include, hattiesburg, petal, west hattiesburg, purvis, lumberton, brooklyn, sunrise, maxie, macedonia, rock hill, rawls springs, baxterville and mclaurin. 3/17/2016 5:56 PM CDT At 556 pm cdt, severe thunderstorms were located along a line extending from improve to pine burr to sandy hook, moving southeast at 40 mph (radar indicated). Hazards include 60 mph wind gusts and penny size hail. Expect damage to roofs. Siding and trees. 3/3/2016 6:22 PM CST At 621 pm cst, a severe thunderstorm was located over west hattiesburg, moving southeast at 60 mph (radar indicated). Hazards include 60 mph wind gusts and quarter size hail. Hail damage to vehicles is expected. expect wind damage to roofs, siding and trees. this severe thunderstorm will be near, petal and oak grove around 625 pm cst. sunrise around 630 pm cst. Mclaurin around 635 pm cst. 2/23/2016 4:32 PM CST At 432 pm cst, a severe thunderstorm capable of producing a tornado was located near west hattiesburg, moving northeast at 40 mph (radar indicated rotation). Hazards include tornado. Flying debris will be dangerous to those caught without shelter. mobile homes will be damaged or destroyed. damage to roofs, windows and vehicles will occur. tree damage is likely. this dangerous storm will be near, hattiesburg and oak grove around 435 pm cst. west hattiesburg around 440 pm cst. Petal and rawls springs around 445 pm cst. 2/23/2016 4:25 PM CST At 425 pm cst, a confirmed tornado was located near purvis, or 9 miles southwest of west hattiesburg, moving northeast at 40 mph (radar confirmed tornado). Hazards include damaging tornado. Flying debris will be dangerous to those caught without shelter. mobile homes will be damaged or destroyed. damage to roofs, windows and vehicles will occur. tree damage is likely. this tornado will be near, hattiesburg around 430 pm cst. oak grove around 435 pm cst. west hattiesburg around 440 pm cst. Petal and rawls springs around 445 pm cst. 2/23/2016 4:20 PM CST At 419 pm cst, a severe thunderstorm capable of producing a tornado was located near purvis, or 13 miles southwest of west hattiesburg, moving northeast at 40 mph (radar indicated rotation). Hazards include tornado. Flying debris will be dangerous to those caught without shelter. mobile homes will be damaged or destroyed. damage to roofs, windows and vehicles will occur. tree damage is likely. this dangerous storm will be near, hattiesburg around 430 pm cst. oak grove around 435 pm cst. west hattiesburg around 440 pm cst. Petal and rawls springs around 445 pm cst. 2/23/2016 4:08 PM CST At 407 pm cst, a severe thunderstorm capable of producing a tornado was located near baxterville, or 11 miles northeast of sandy hook, moving northeast at 40 mph (radar indicated rotation). Hazards include tornado. Flying debris will be dangerous to those caught without shelter. mobile homes will be damaged or destroyed. damage to roofs, windows and vehicles will occur. tree damage is likely. this dangerous storm will be near, pine ridge around 425 pm cst. hattiesburg around 430 pm cst. oak grove around 435 pm cst. 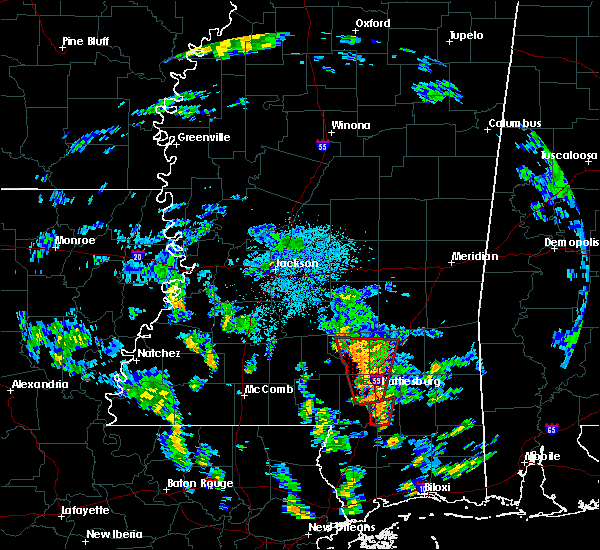 west hattiesburg and sumrall around 440 pm cst. Rawls springs around 445 pm cst. 2/23/2016 3:58 PM CST At 358 pm cst, a confirmed tornado was located near pinebur, or near sandy hook, moving northeast at 40 mph (radar confirmed tornado). Hazards include damaging tornado and quarter size hail. Flying debris will be dangerous to those caught without shelter. mobile homes will be damaged or destroyed. damage to roofs, windows and vehicles will occur. tree damage is likely. this tornado will be near, baxterville and pinebur around 405 pm cst. pine ridge around 425 pm cst. hattiesburg around 430 pm cst. oak grove around 435 pm cst. west hattiesburg and sumrall around 440 pm cst. Rawls springs around 445 pm cst. 2/23/2016 3:51 PM CST At 351 pm cst, a severe thunderstorm capable of producing a tornado was located near sandy hook, moving northeast at 40 mph (radar indicated rotation). Hazards include tornado. Flying debris will be dangerous to those caught without shelter. mobile homes will be damaged or destroyed. damage to roofs, windows and vehicles will occur. tree damage is likely. this dangerous storm will be near, baxterville and pinebur around 405 pm cst. pine ridge around 425 pm cst. hattiesburg around 430 pm cst. oak grove around 435 pm cst. west hattiesburg and sumrall around 440 pm cst. Rawls springs around 445 pm cst. 2/23/2016 3:45 PM CST At 345 pm cst, a severe thunderstorm was located near sandy hook, moving northeast at 40 mph (radar indicated). Hazards include 60 mph wind gusts and quarter size hail. Hail damage to vehicles is expected. expect wind damage to roofs, siding and trees. this severe thunderstorm will be near, sandy hook around 350 pm cst. pinebur and baxterville around 405 pm cst. improve around 425 pm cst. hattiesburg around 430 pm cst. sumrall around 440 pm cst. 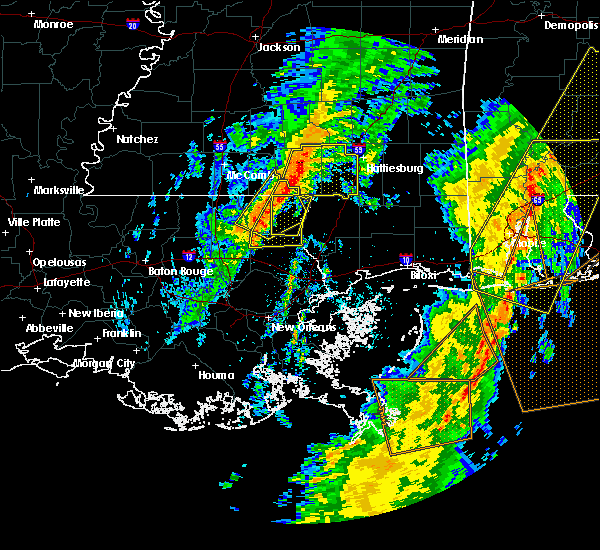 A tornado watch remains in effect until 1000 pm cst for southeastern mississippi. 2/23/2016 2:04 PM CST At 204 pm cst, a severe thunderstorm was located near baxterville, or 15 miles southwest of west hattiesburg, moving north at 50 mph (radar indicated). Hazards include 60 mph wind gusts. Expect damage to roofs. siding and trees. 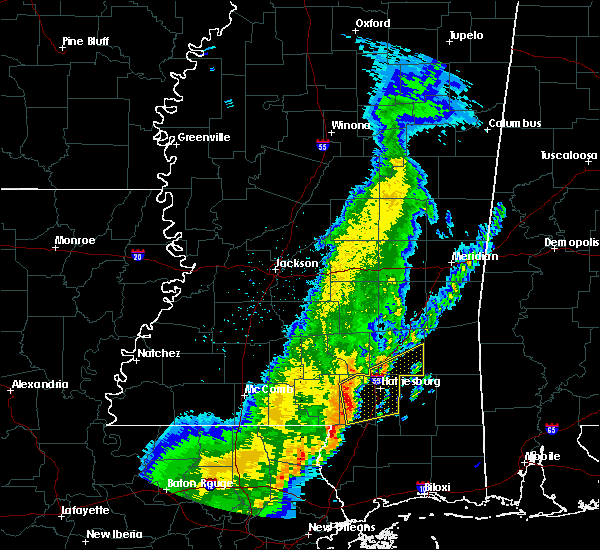 this severe storm will be near, hattiesburg around 215 pm cst. west hattiesburg and oak grove around 220 pm cst. 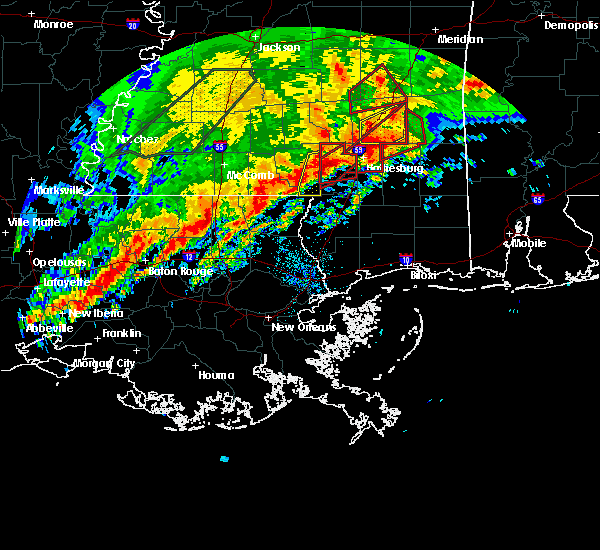 Sumrall around 225 pm cst. 2/23/2016 1:49 PM CST At 148 pm cst, a severe thunderstorm was located 8 miles south of baxterville, or 9 miles north of poplarville, moving northeast at 40 mph (radar indicated). Hazards include 60 mph wind gusts. Expect damage to roofs. siding and trees. this severe thunderstorm will be near, lumberton and baxterville around 200 pm cst. purvis and pine ridge around 215 pm cst. hattiesburg and oak grove around 225 pm cst. West hattiesburg around 230 pm cst. 12/28/2015 6:18 AM CST At 618 am cst, severe thunderstorms were located along a line extending from 6 miles southwest of moss to hattiesburg, moving northeast at 40 mph (radar indicated). Hazards include 60 mph wind gusts. Expect damage to roofs. siding and trees. these severe storms will be near, moselle around 630 am cst. other locations impacted by these severe thunderstorms include soso. 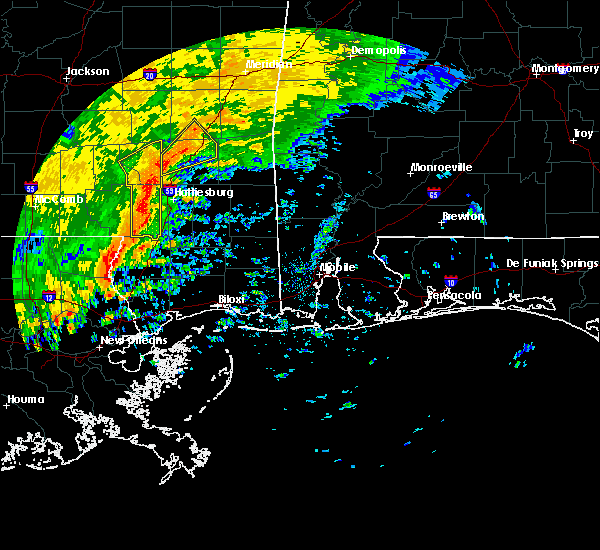 A tornado watch remains in effect until 800 am cst for southeastern mississippi. 12/28/2015 5:25 AM CST At 525 am cst, severe thunderstorms were located along a line extending from melba to near baxterville, moving northeast at 45 mph (radar indicated). Hazards include 60 mph wind gusts. Expect damage to roofs. siding and trees. 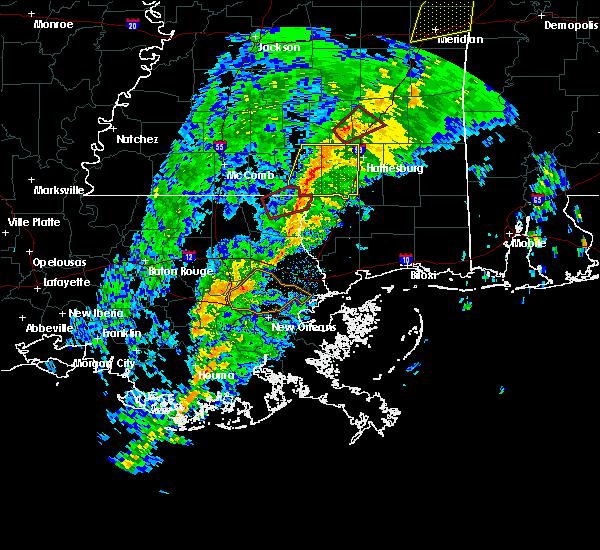 severe thunderstorms will be near, sumrall and melba around 530 am cst. sanford around 540 am cst. collins, purvis and pine ridge around 545 am cst. hattiesburg around 550 am cst. oak grove around 555 am cst. 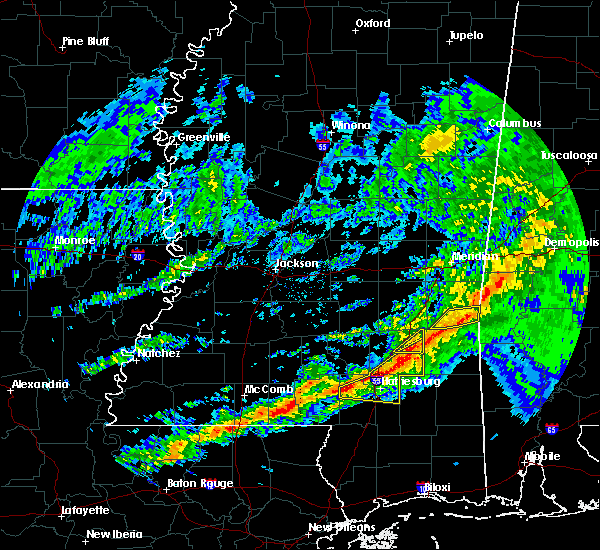 west hattiesburg and hebron around 600 am cst. petal and rawls springs around 605 am cst. eastabuchie around 610 am cst. other locations impacted by these severe thunderstorms include soso and seminary. 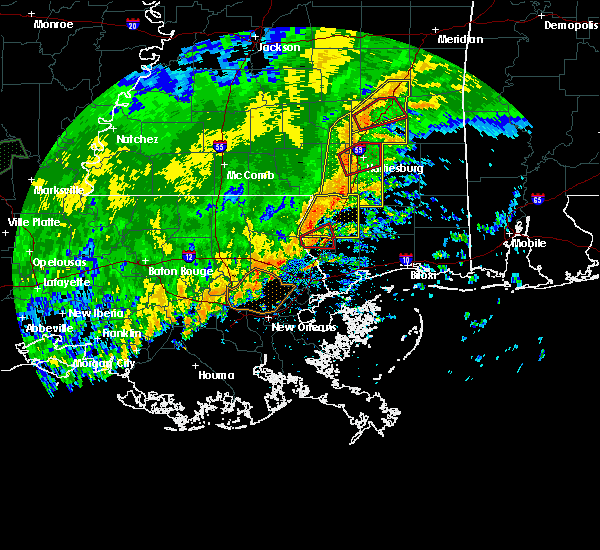 A tornado watch remains in effect until 800 am cst for southeastern mississippi. 12/23/2015 8:08 AM CST At 807 am cst, severe thunderstorms were located along a line extending from sanford to 7 miles west of west hattiesburg, moving northeast at 30 mph (radar indicated). Hazards include 60 mph wind gusts. Expect damage to roofs. siding and trees. 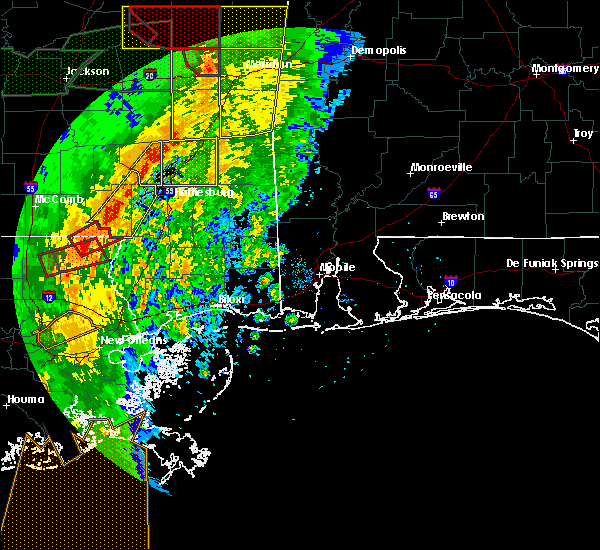 these severe storms will be near, hattiesburg and sanford around 815 am cst. rawls springs around 825 am cst. laurel, ellisville and eastabuchie around 840 am cst. moselle around 845 am cst. Other locations impacted by these severe thunderstorms include soso. 12/23/2015 7:58 AM CST At 758 am cst, a severe thunderstorm was located over sanford, or 11 miles northwest of west hattiesburg, moving northeast at 50 mph (radar indicated). Hazards include 60 mph wind gusts. Expect damage to roofs. siding and trees. this severe storm will be near, moselle around 810 am cst. hebron around 815 am cst. laurel and ellisville around 820 am cst. Other locations impacted by this severe thunderstorm include soso and seminary. 12/23/2015 7:45 AM CST At 745 am cst, a severe thunderstorm was located near sumrall, or 12 miles west of west hattiesburg, moving northeast at 55 mph (radar indicated). Hazards include 60 mph wind gusts. Expect damage to roofs. siding and trees. 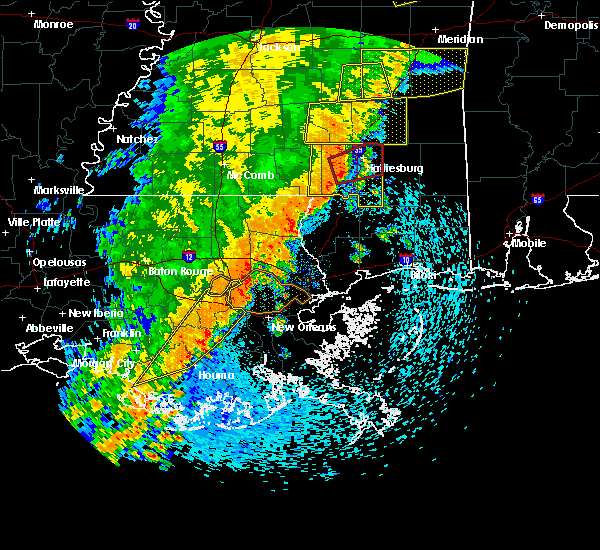 this severe thunderstorm will be near, sumrall around 750 am cst. rawls springs around 755 am cst. sanford around 800 am cst. moselle around 810 am cst. ellisville around 815 am cst. laurel around 820 am cst. Other locations impacted by this severe thunderstorm include soso and seminary. 10/31/2015 4:19 PM CDT At 419 pm cdt, a severe thunderstorm capable of producing a tornado was located over west hattiesburg, moving northeast at 45 mph (radar indicated rotation). Hazards include tornado. Flying debris will be dangerous to those caught without shelter. mobile homes will be damaged or destroyed. damage to roofs, windows and vehicles will occur. tree damage is likely. this dangerous storm will be near, oak grove around 425 pm cdt. petal, sunrise and eastabuchie around 430 pm cdt. Macedonia around 440 pm cdt. 10/31/2015 4:07 PM CDT At 406 pm cdt, severe thunderstorms were located along a line extending from near sanford to 8 miles northwest of purvis to near baxterville, moving east at 30 mph (radar indicated). Hazards include 60 mph wind gusts. Expect damage to roofs. siding and trees. 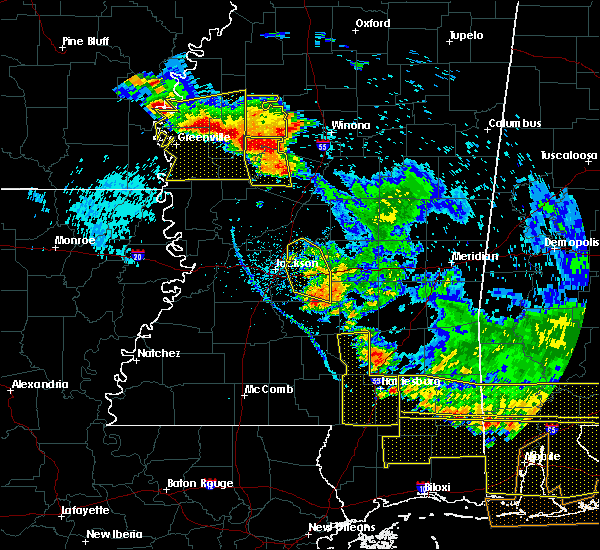 severe thunderstorms will be near, hattiesburg and rawls springs around 410 pm cdt. 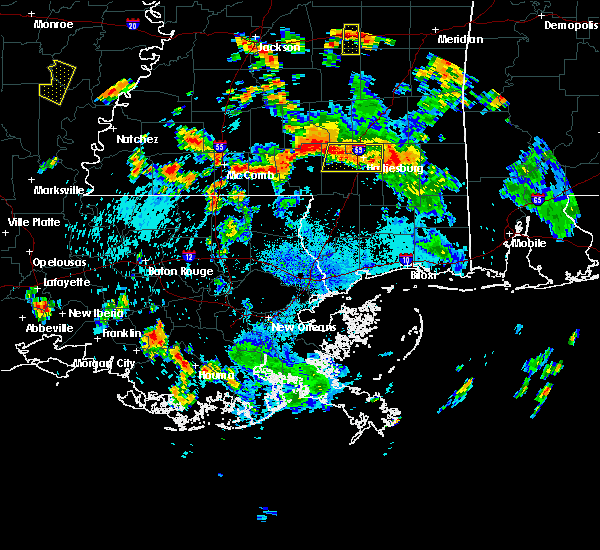 west hattiesburg, moselle and eastabuchie around 420 pm cdt. 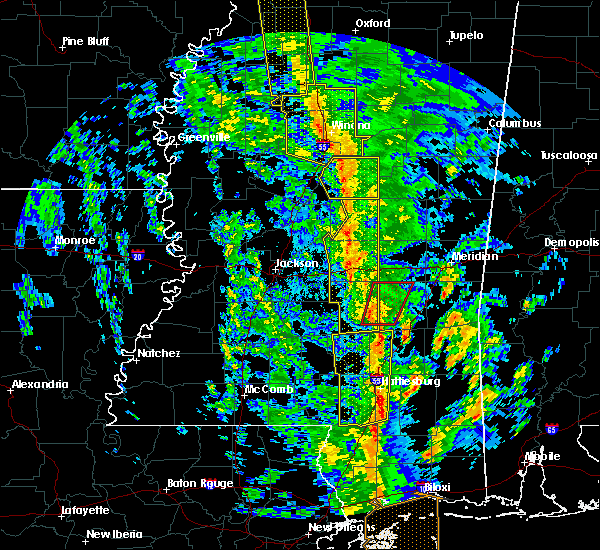 petal around 435 pm cdt. mclaurin, rock hill and sunrise around 440 pm cdt. ovett, brooklyn, maxie and macedonia around 445 pm cdt. other locations impacted by these severe thunderstorms include rhodes and corinth. A tornado watch remains in effect until 700 pm cdt for southeastern mississippi. 8/8/2015 7:03 PM CDT At 702 pm cdt, a severe thunderstorm was located near moselle, or 9 miles southwest of ellisville, moving south at 20 mph (radar indicated). Hazards include 60 mph wind gusts and quarter size hail. Hail damage to vehicles is expected. expect wind damage to roofs, siding and trees. this severe thunderstorm will be near, moselle around 710 pm cdt. eastabuchie around 725 pm cdt. rawls springs around 735 pm cdt. 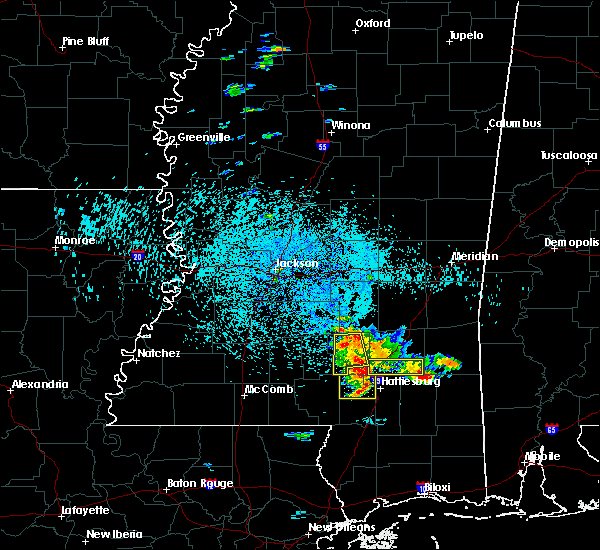 petal around 745 pm cdt. west hattiesburg around 750 pm cdt. Oak grove and sunrise around 755 pm cdt. 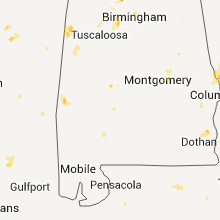 7/5/2015 1:42 PM CDT At 141 pm cdt, severe thunderstorms were located along a line extending from near columbia to mclaurin, moving southeast at 30 mph (radar indicated). Hazards include 60 mph wind gusts and quarter size hail. Hail damage to vehicles is expected. expect wind damage to roofs, siding and trees. Locations impacted include, hattiesburg, petal, columbia, west hattiesburg, purvis, brooklyn, sunrise, rock hill, morgantown, pinebur, mclaurin, improve and rawls springs. 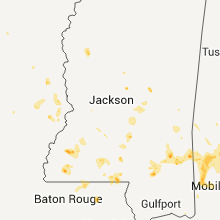 7/5/2015 1:22 PM CDT At 122 pm cdt, severe thunderstorms were located along a line extending from near improve to near petal, moving east at 30 mph (radar indicated). Hazards include 60 mph wind gusts and quarter size hail. Hail damage to vehicles is expected. Expect wind damage to roofs, siding and trees. 7/4/2015 2:28 PM CDT At 228 pm cdt, severe thunderstorms were located along a line extending from near sanford to west hattiesburg to near rock hill, moving northeast at 30 mph (radar indicated). Hazards include 60 mph wind gusts. Expect damage to roofs. siding and trees. severe thunderstorms will be near, mclaurin around 240 pm cdt. eastabuchie around 245 pm cdt. moselle around 250 pm cdt. Other locations impacted by these severe thunderstorms include rhodes. 6/24/2015 1:51 PM CDT At 151 pm cdt, a severe thunderstorm was located near sumrall, or 7 miles west of west hattiesburg, moving south at 15 mph (radar indicated). Hazards include 60 mph wind gusts and quarter size hail. Hail damage to vehicles is expected. expect wind damage to roofs, siding and trees. Locations impacted include, hattiesburg, west hattiesburg, sumrall, rawls springs and sanford. 6/24/2015 1:32 PM CDT At 131 pm cdt, a severe thunderstorm was located near sumrall, or 8 miles northwest of west hattiesburg, moving south at 10 mph (radar indicated). Hazards include 60 mph wind gusts and quarter size hail. Hail damage to vehicles is expected. expect wind damage to roofs, siding and trees. Locations impacted include, hattiesburg, west hattiesburg, sumrall, rawls springs and sanford. 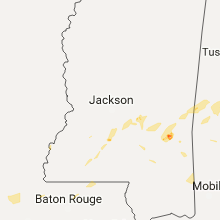 6/24/2015 1:12 PM CDT At 112 pm cdt, a severe thunderstorm was located near sumrall, or 10 miles northwest of west hattiesburg, and is nearly stationary (radar indicated). Hazards include 60 mph wind gusts and quarter size hail. Hail damage to vehicles is expected. expect wind damage to roofs, siding and trees. This severe thunderstorm will be near, hattiesburg, west hattiesburg and rawls springs around 215 pm cdt.